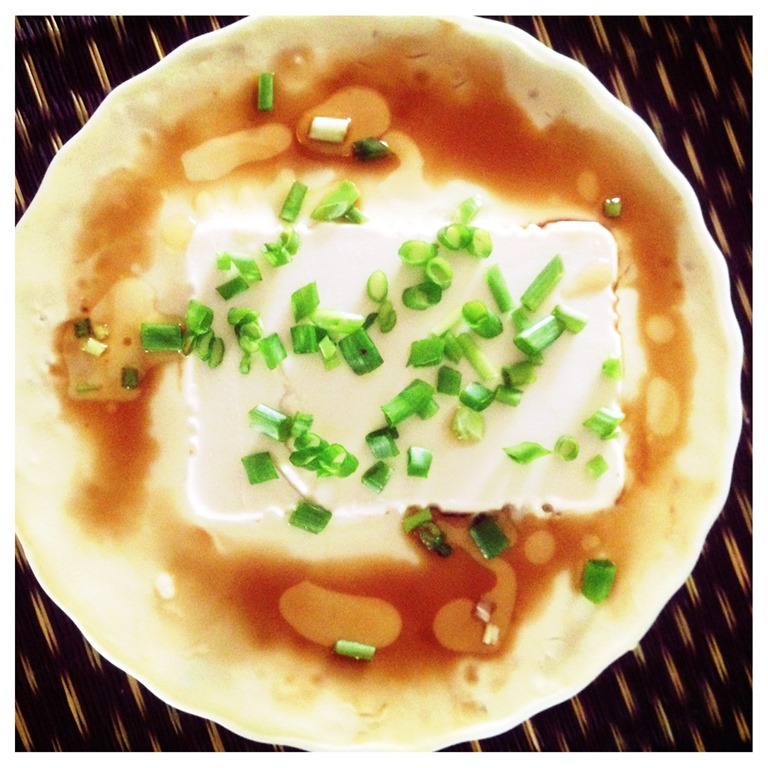 I have not forgotten about this series – “What I Cooked Today Series”! I have discontinued for a while because I am a vegetarian and the dishes were usually cooked by my mother in law who is visiting me. Therefore, I can’t claim the credit of the dishes cooked if I posted it. Well this series will be starting soon in one two weeks time after end of my vegetarian diet. This year, I have calculated wrongly about the starting date of my diet, therefore, I am having slightly more than 2 months of vegetarian diet and it was pointed out by my neighbour when I keep on rejecting her meat dishes. She asked curiously why the diet is so long this year, she said it cannot be ! I asked my wife to recalculate again and yes, we are wrong as both of us are not that concern about anniversary dates. Yesterday is the Mid Autumn Festival, one of the very big festivals for the Chinese worldwide. Even People’s Republic of China’s government have declared this day as a holiday in recent years. Usually, in big festivals, family gathering and get together is very important. I only confirmed to invite my nephew’s family for dinner yesterday morning and I told them that I would only cooked what I have at home. As they are my very close relatives, I need not really concerned about what I should cooked as he have been staying with me for the past few years. I did not have the time to plan for the meal as I have to take care of the kids and I have to rush out my report for Eight Treasure Porridge. I only started cooking at 4.00 pm in the afternoon. I looked at the fridge, I have some tofu, one pumpkin, one luffa, some chicken fillets, some asparaguses, minced meats, chicken thighs, drumsticks and fish fillets. What influenced my dish menu last night was what I perceived what my family members like to have. I know anything soft and silky will be welcomed by them, so tofu and pumpkins would be good choices. 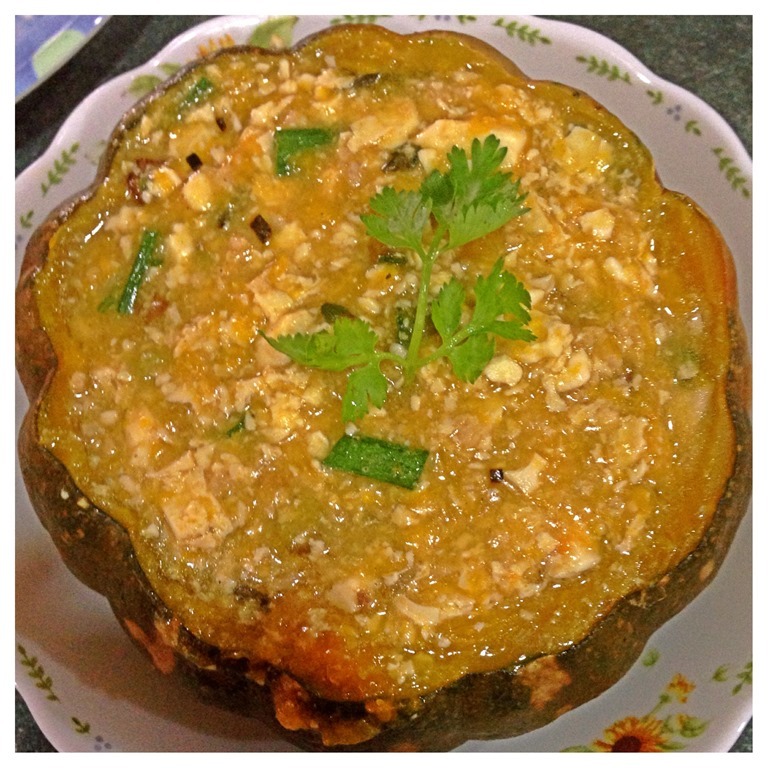 While the family always have bitter gourd with minced meat, but luffa with minced meat is something new to them. In addition, my kids loved luffa so luffa with minced meat was in the menu. Preparing these two dishes had resulted some mesh pumpkins, minced meat and tofu left, therefore, I have decided to turn these 3 ingredients into a dish. 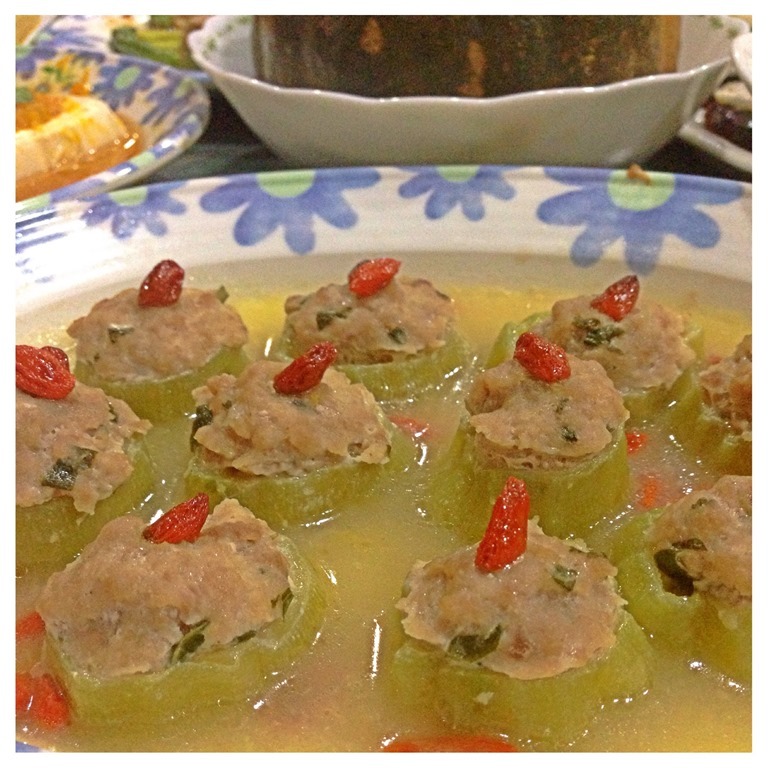 This is a dish adapted from pork stuffed bitter gourd (苦瓜酿肉碎). The luffa was first de-skinned, and cut into 2 cm chunks. Make a hole in the centre and set aside. Minced pork were marinated for about 10 minutes with sesame oil, corn flour, light soya sauce, flavour enhancers, sugar, pepper, chopped coriander leaves and chopped winter vegetables. 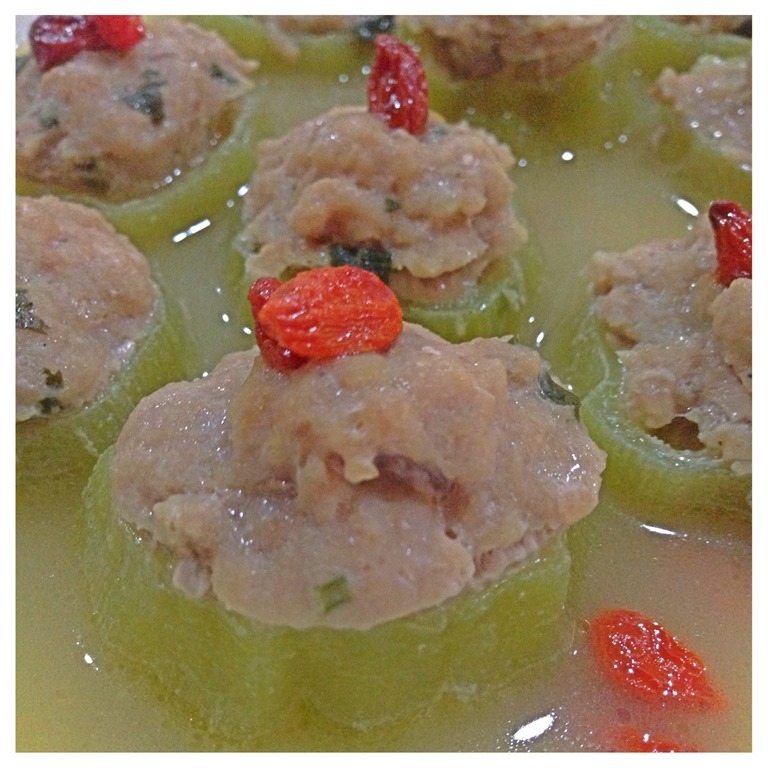 Stuff the minced pork into the hole of the luffa chunks, placed it in a serving plate nicely and put a goof berry on top of minced meat for garnishing. Before steaming, put some water in the plate of the meat stuffed luffa. (A bit of water is important as it will speed up the process of cooking the luffa. The luffa will be “water bathed” causing it easier to get cooked). Steamed for about 20 minutes or until your luffa is soft. More juices will be secreted out and these gravy was very tasty as it was essentially a meat and vegetable broth. You can put some corn starch to thicken this juices if desirable. I have to admit that I do not know how to name this dish. Since it looks like a seas of mashed pumpkins, I named this as “tofu sail pumpkin seas”. Firstly, I cut opened a pumpkin, de-seeded and steamed the pumpkin until the pumpkin was soft. I then scratched out the pumpkin flesh, put some sesame oils, salt, mushroom concentrate, mixed well and let the mashed pumpkin to cool. Two packets of tofu’s were cut into 8 pieces and arrange in a serving plate. I used a teaspoon to make a hole on the tofu, put some mashed pumpkins to cover the hole. Use the remaining pumpkin to put beside the tofu and steamed for about 10 minutes. Surprisingly, the tofu and pumpkins really blends well. From the above two dishes, I have some mashed pumpkin left , some tofu left (from making a hole in the tofu cubes), some minced meat left (as I have prepared one package of minced meat for the luffa dish, therefore, I still have about half of the minced meat left). With these 3 ingredients, I have decided to mash the tofu and fried these 3 ingredients together. I first stir fried some spring onion (white part) in a frying pan of hot oil until aromatic, followed by the minced meat and once the meat was 50% cooked, add the mesh pumpkin and mesh tofu. Stir fried for another 2-3 minutes, add white pepper, sugar, light soya sauce and salt and it become a rather presentable dish..like the famous Shanghai dish, “Tofu With Hairy Crab Roe”. 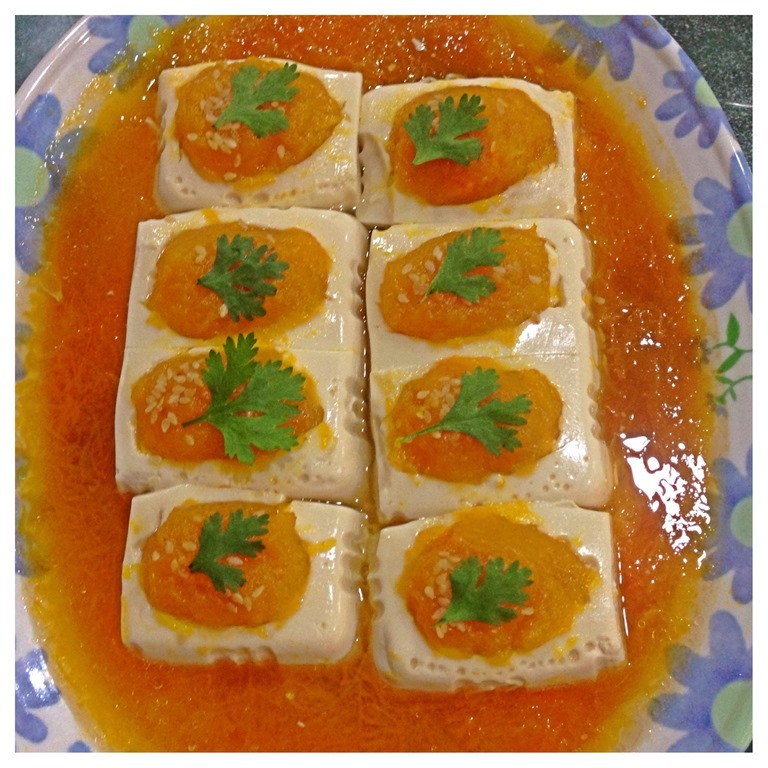 Therefore I have named this dish in Mandarin the “Fake Tofu With Hairy Crab Roe”. 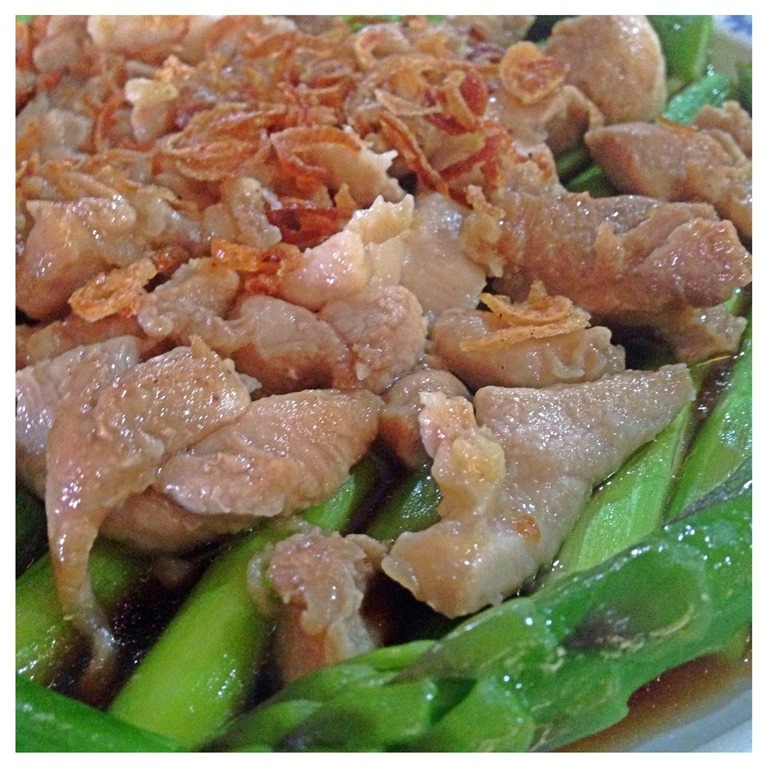 The dish was very tasty and smooth, it is well liked by the kids because of the aromatic spring onions. I have placed the cooked dish in the empty shell of the pumpkin for serving. This is really an easy dish. Have a pot of boiling hot water, drizzle a few drops of cooking oil and pinches of salt. Get ready a serving plate and put some oyster sauce on the plate. Blanched the asparagus in the hot boiling water for 3 minutes and dip in icy cold cooked water. 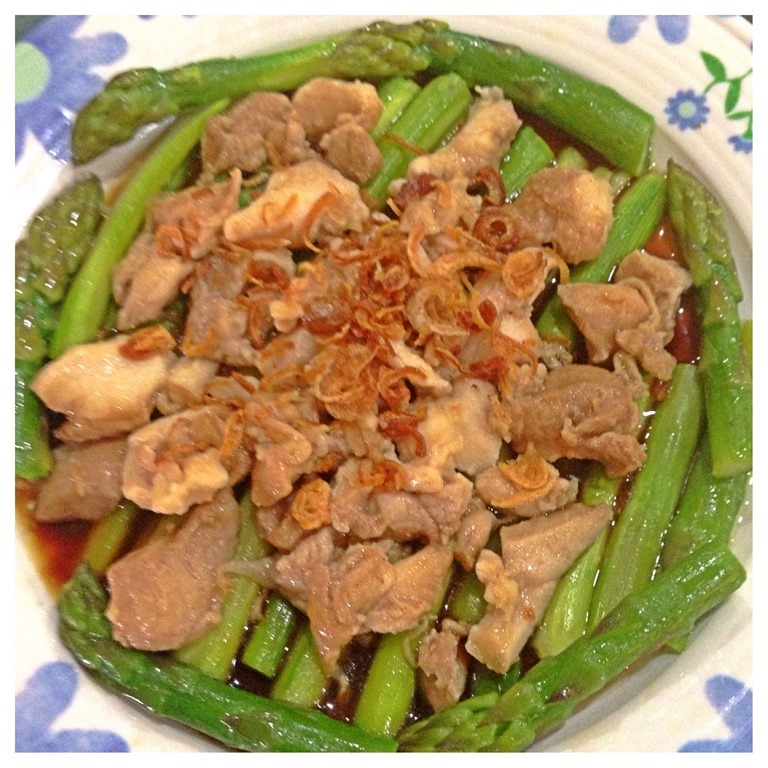 Place these asparagus neatly in the serving plate on top of the oyster sauce. Coated the chicken fillet with some corn flours and blanched the chicken fillets in the hot boiling water for about 5 minutes. Scoop out and placed on top of the blanched asparagus. Sprinkled some fried shallots on top of the chicken and the dish was done. This was definitely an easy and healthier dish as it involved no frying like the traditional method. Though I did not taste the asparagus but I can tell you that it was sweet as all the juices were being sealed inside the asparagus via blanching method of cooking. This dish was usually treated an appetizer in Chinese full course dinners and did not really need any preparation. As I have quite a lot of pickled ginger left from my demonstration in Guaishushu’s Page, therefore, I have decided to prepare this dish as an appetizer. You may want to learn about how to prepare the pickled gingers HERE. 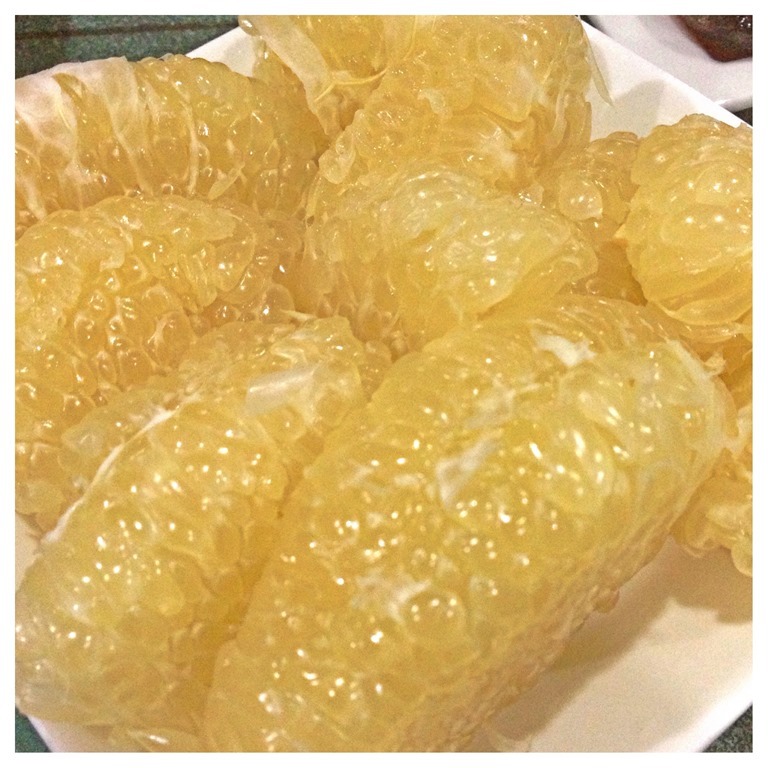 When I was young, we did not celebrate Moon Cake Festivals with pomelo. However, in recent years, it seemed that it is very common that pomelo became one of the festival fruit during the Moon Cake Festivals. I checked the internet, pomelo have the syllables as “have kids” (有子）in Mandarin, therefore, having pomelo means that it will bring you luck in conceiving a kid. Well, definitely not for me. It is my usual way to de-skin my pomelo like what is in the picture to make it easier for my kids to eat. Therefore, all my kids loves to eat pomelo as they do not need to peel the internal white membranes separating the lobes in the fruit. They have been pampered, Unlike me, I never like to eat pomelo when I was young because of the difficulty to peel of the internal white membranes. This is nothing to do with this festival. I just spotted in the supermarket a few days ago and I really love these green dates. I always called it mini apples. In my humble opinion, it taste like apples and is a one bite size. I am able to finish one box within a day. I don’t know but I do believe it is a very healthy snack, much healthy than any carbohydrates and sugar loaded snacks. 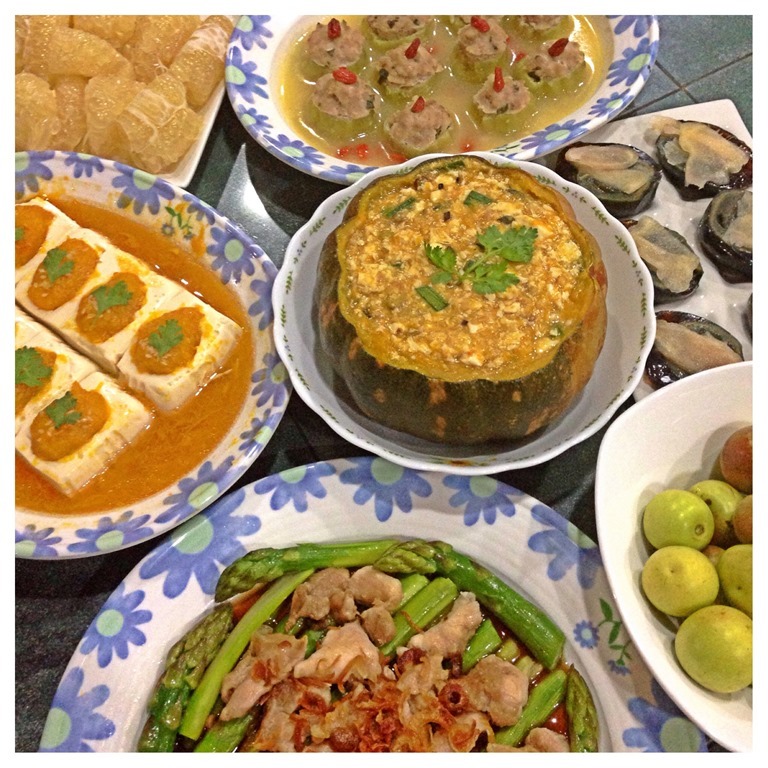 Yesterday, it was served together with pomelo after dinner. I have a few boxes of moon cakes and I have decided to serve a durian moon cake that my nephew gave me from the international “Three” Seasons Hotel. 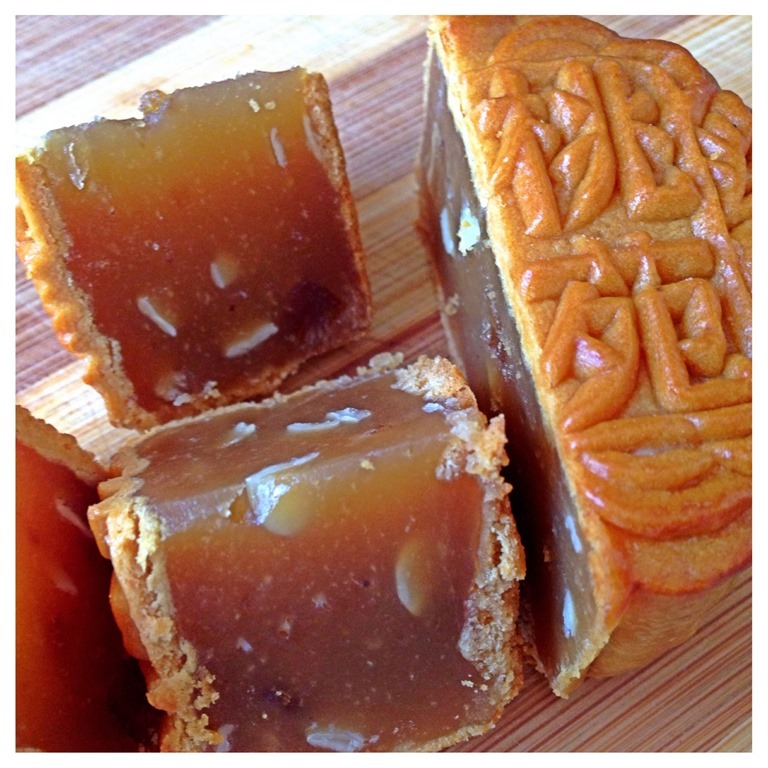 However, I am rather disappointed with the moon cakes. Put in bluntly, it is just pure durian flesh wrapped in snow skin. 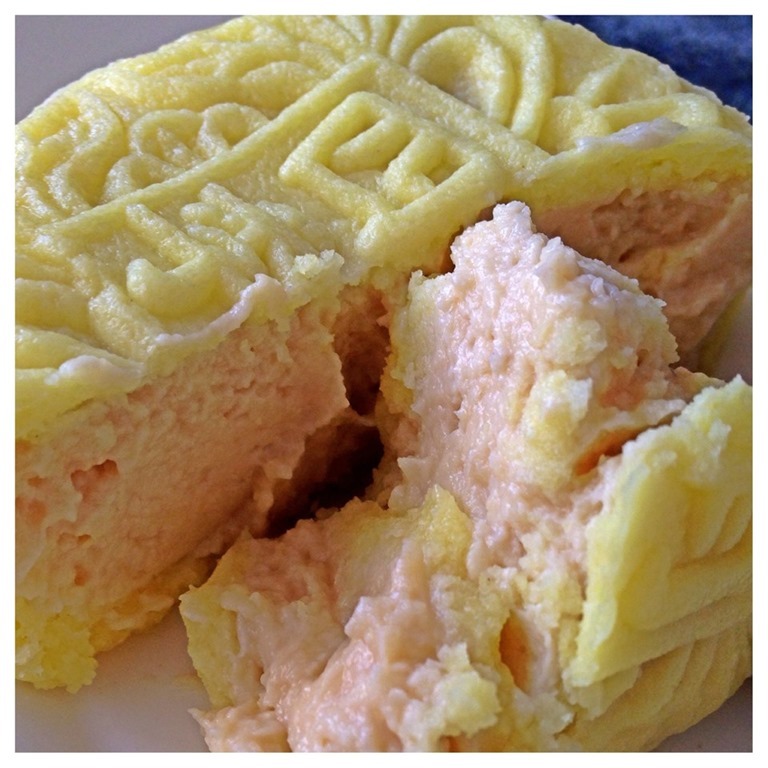 When you eat the moon cakes, it is very soft and just like when one is eating fresh durian (though it don’t taste that fresh any more after so many days). It was definitely not cheap and my nephew told me even after discount, one small moon cake cost SGD 12. I honestly believed that should I received the moon cake earlier, I will be able to replicate the moon cake .. and how much is one durian is this season? May be 3 durians for SGD 10? Well the one below is equally disappointing as they have incorporate orange flavour in the lotus seeds fillings. Lastly, I hoped that you like my cooking adventures today and unlike previous festivals, I have cooked something very simple. In other festivals, majority were meat dishes and I managed to locate an old picture in my Facebook to share with you. This was taken by one of my nieces in 2012 to celebrate Chap Goh Me (元宵）during Chinese New Year. Have a nice day and cheers. Yesterday is really a busy day for me. 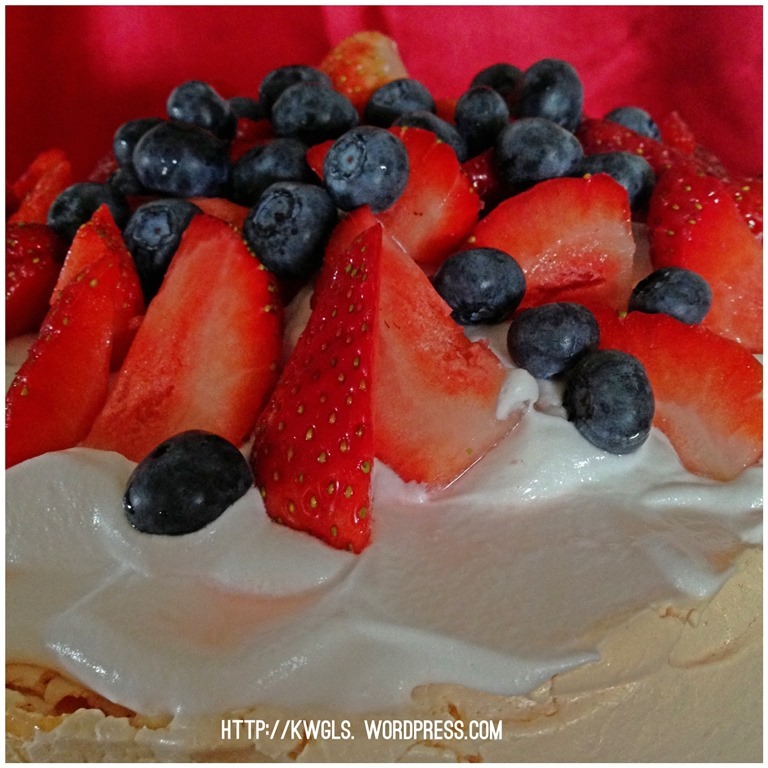 I have been making mayonnaise, baking pizza and this Pavlova. By the time I have to take picture of this Pavlova, I was feeling extremely tired and after I ate one slice and kept 3 slices for other families members, I gave away the rest to my neighbour who were having some sort of house gathering. I hoped I have adequate pictures to share with readers. 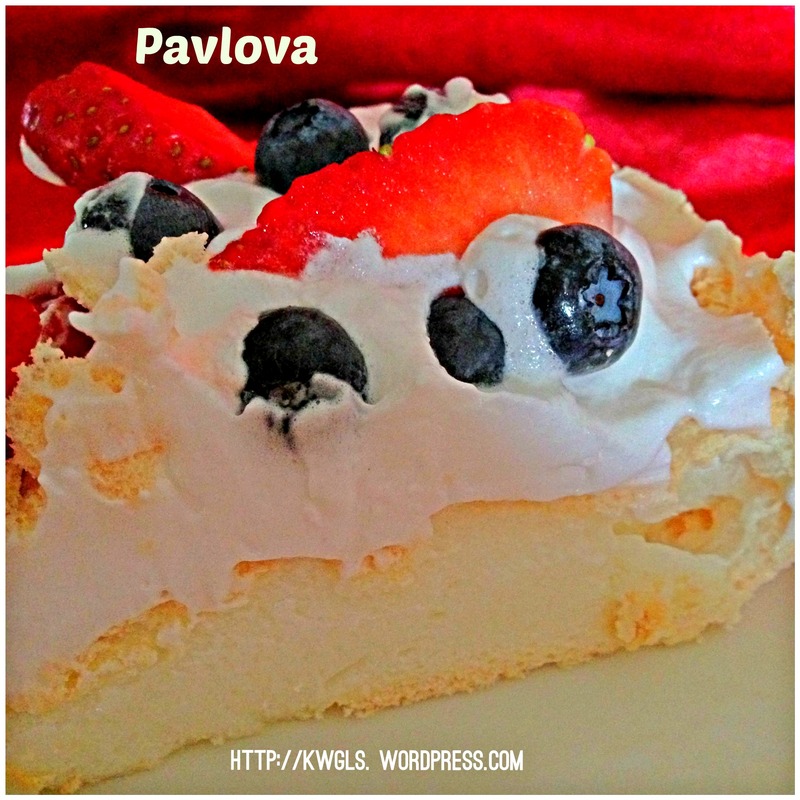 Pavlova actually sounds familiar to me. Just like Vladimir, Sergei, Liana and Nathasia, the name sounds so Russian. 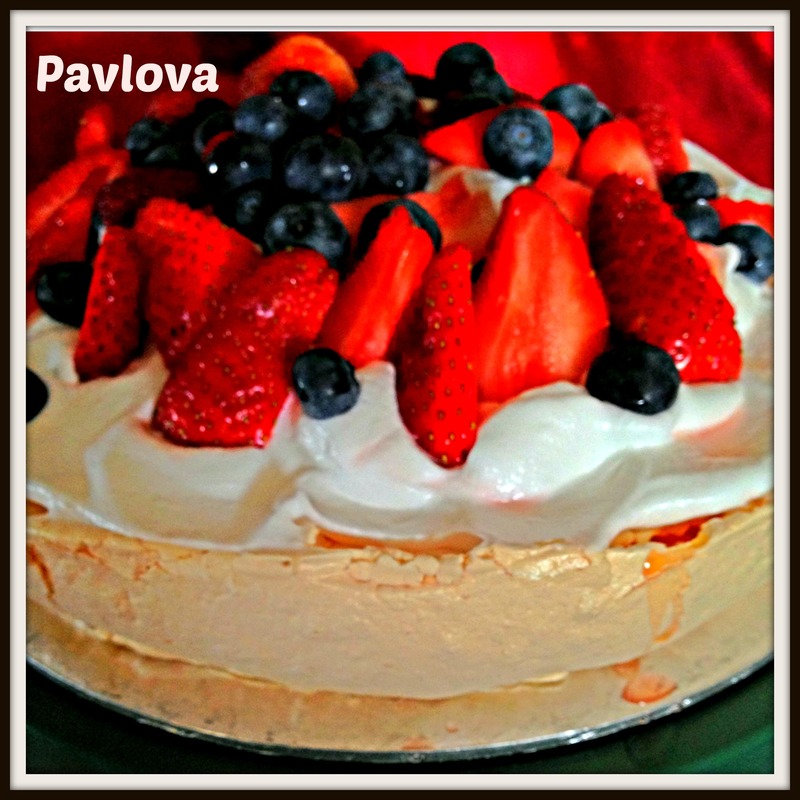 I have spent some times in Russian before and one of my ex-colleagues do carry the name Pavlova. In fact, I do not know it is the name of one of the famous desserts until very recently when I did a read up on meringue, macaroons and other egg whites based pastry items. 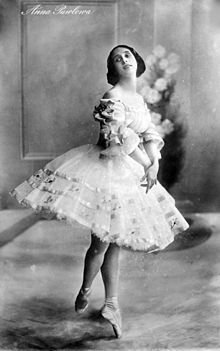 Pavlova is a meringue-based dessert named after the Russian ballet dancer Anna Pavlova. It is a meringue dessert with a crisp crust and soft, light inside. The dessert is believed to have been created in honour of the dancer either during or after one of her tours to Australia and New Zealand in the 1920s. The nationality of its creator has been a source of argument between the two nations for many years, but formal research indicates New Zealand as the source. The dessert is a popular dish and an important part of the national cuisine of both countries, and with its simple recipe, is frequently served during celebratory and holiday meals. 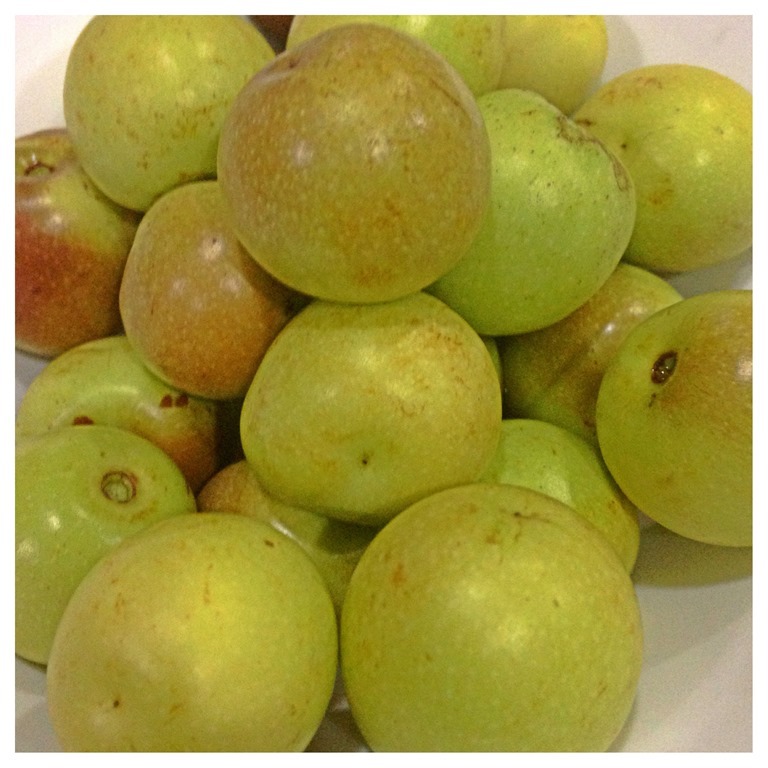 It is a dessert most identified with the summer time, but is eaten all year round in many Australian and New Zealand homes. 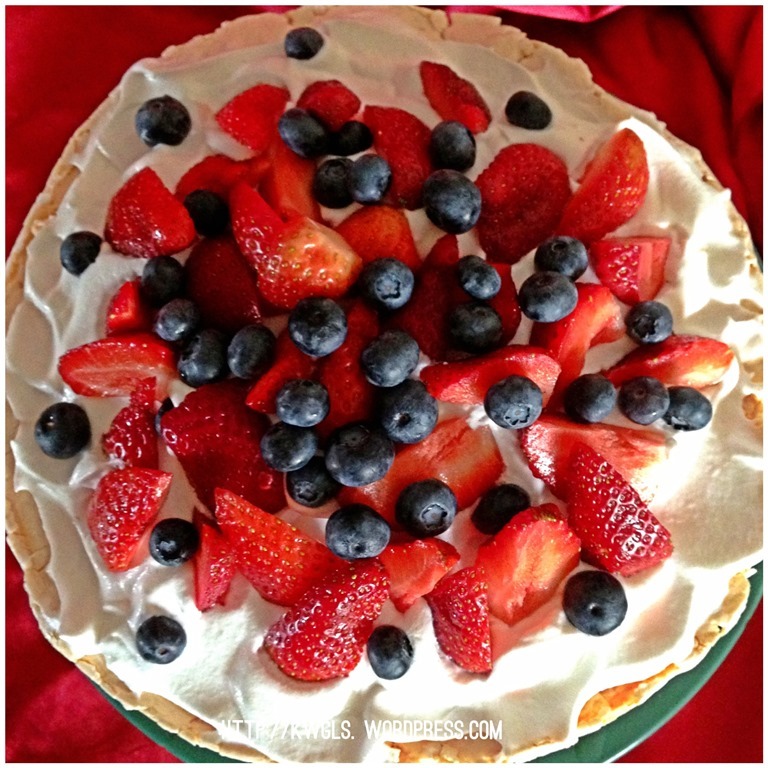 Meringue based dessert will mean this dessert only utilizes egg whites and some sugar. 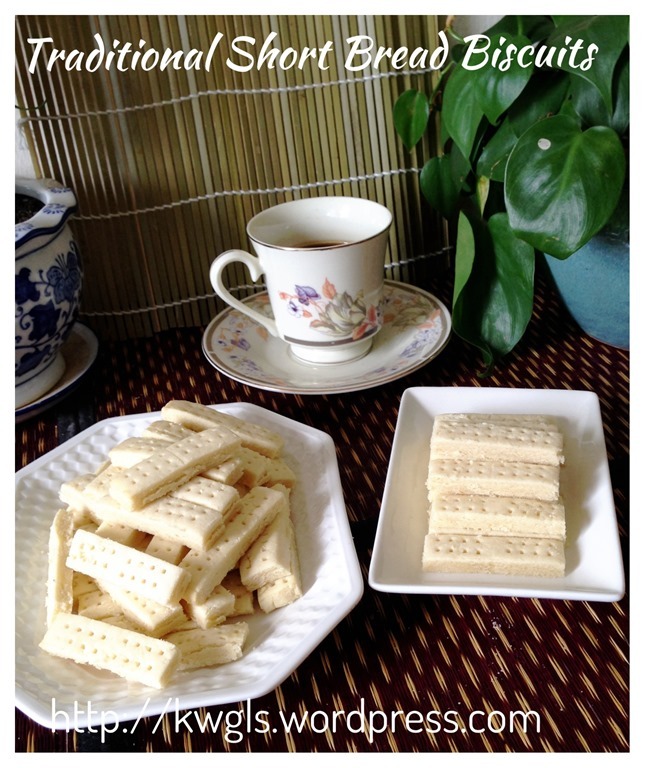 It is not really a common dessert in Singapore and Malaysia. 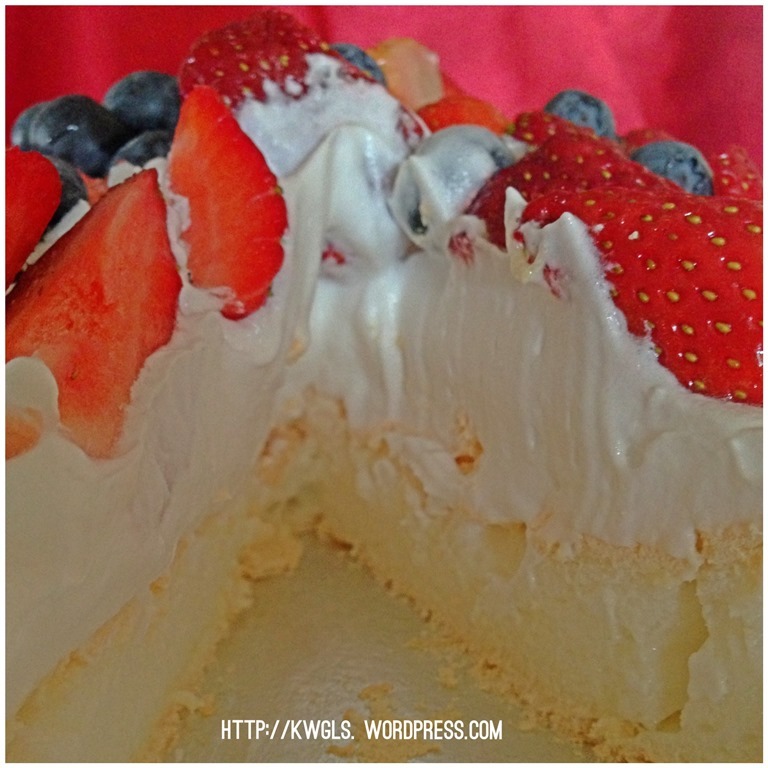 The challenge is to prepare a Pavlova that had a crispy outside of soft cotton liked inside. 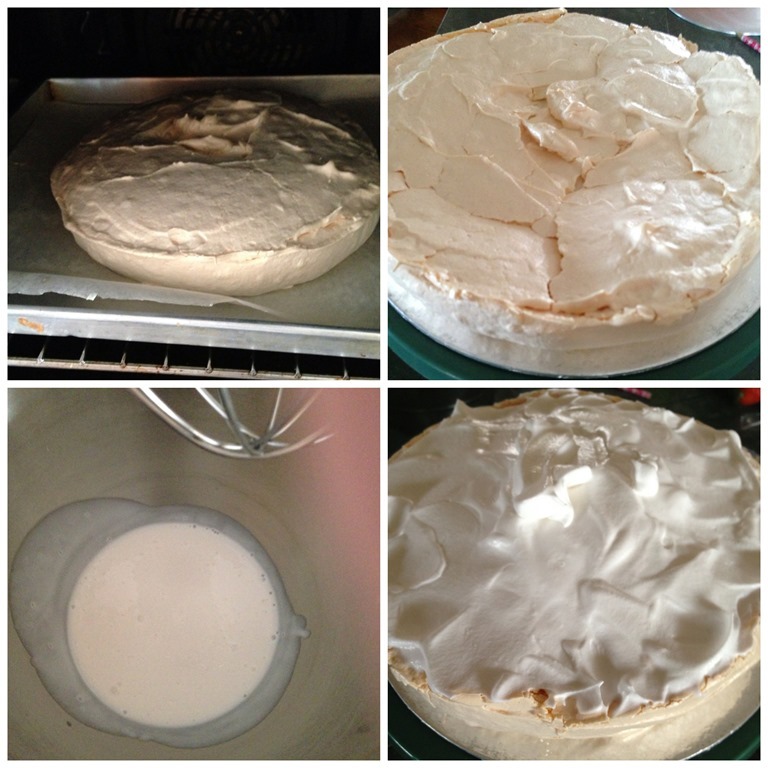 Preparation is not really that tough but patience is needed in the baking of this simple meringue. Fresh fruits of your choice. In this illustration, I have used fresh strawberry and blueberry. The egg whites have to be at room temperature. Colder egg whites are more difficult to beat to peak condition. I have substituted the castor sugar with icing sugar as it will be easier for it to dissolve in the egg whites. 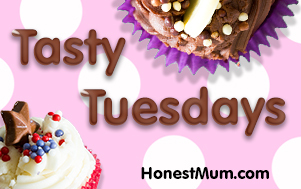 If it is difficult for you to get icing sugar, just blend the castor sugar using a food processor. Usually, corn starch is used. However, as I did not have corn starch with me, I have used potatoes starch. 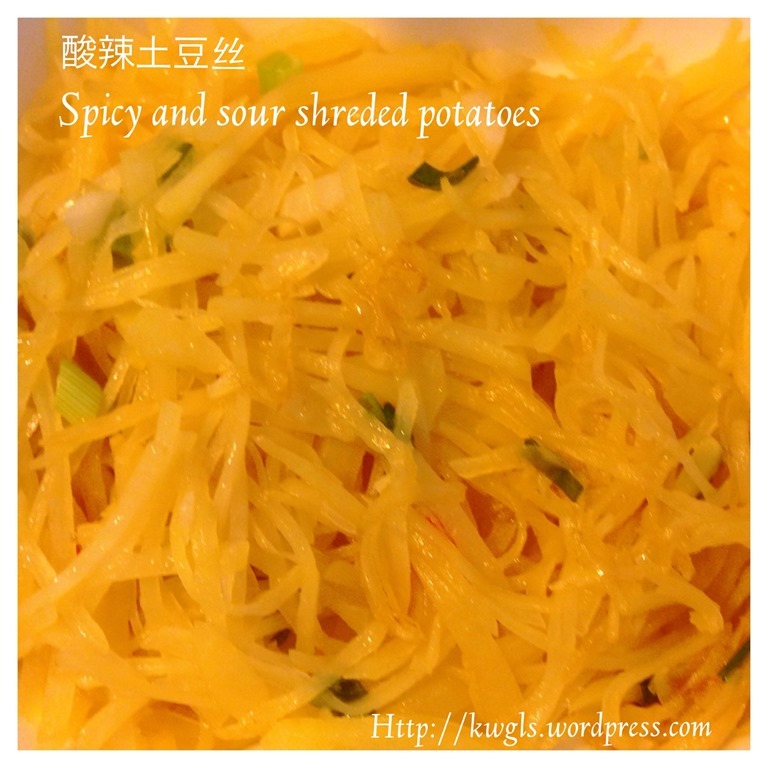 By the same logic, sweet potatoes starch and tapioca starch can also be used. What is needed is a small quantity of flour that is light and smooth to help holding the Pavlova structure. In a baking tray. have a piece of baking/parchment paper. Use a 8” round baking tin and draw a big circle on the baking sheet. Set aside for later use. 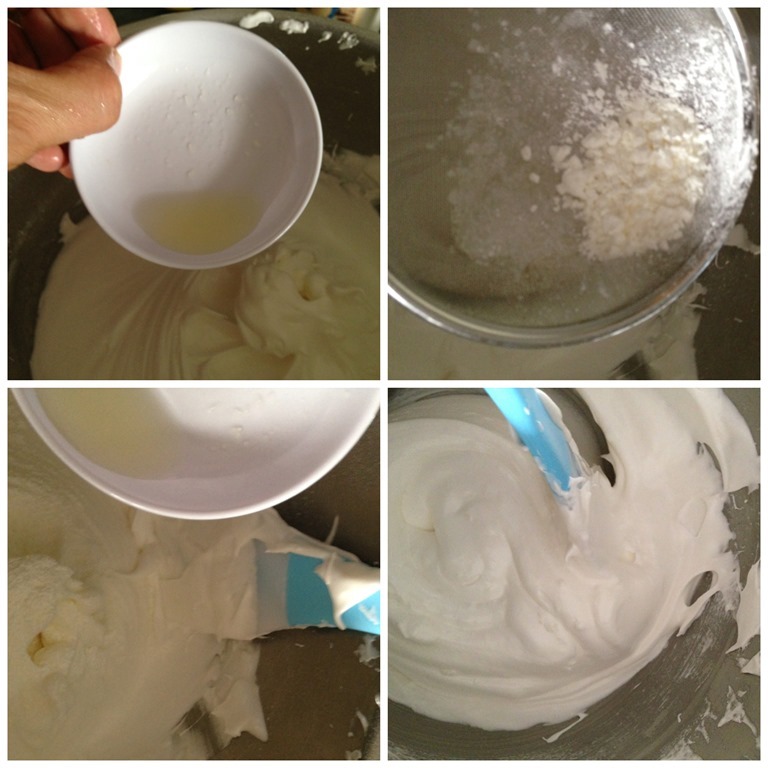 In a mixing bowl, Add egg white and beat until soft peak form. Add in icing sugar spoon by spoon and continue to beat until the egg white is thick and glossy. To check if all sugars have been dissolved, rub a bit of the beaten egg whites (meringues) between the thumb and index fingers. If it is smooth, it means that the sugars have been dissolved. If it feels sandy, it means that the sugar has yet to be dissolved. Continue beating for another 1-2 minutes and test again. Add in vanilla essence and continue beating until it is well mixed. 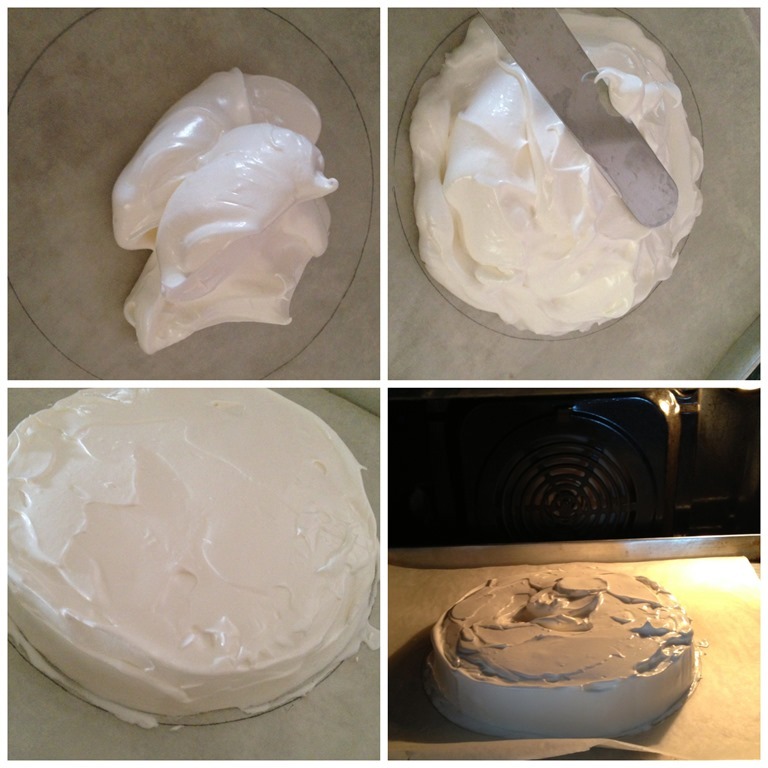 Off the machine if the meringue is glossy and in its stiff peak form. 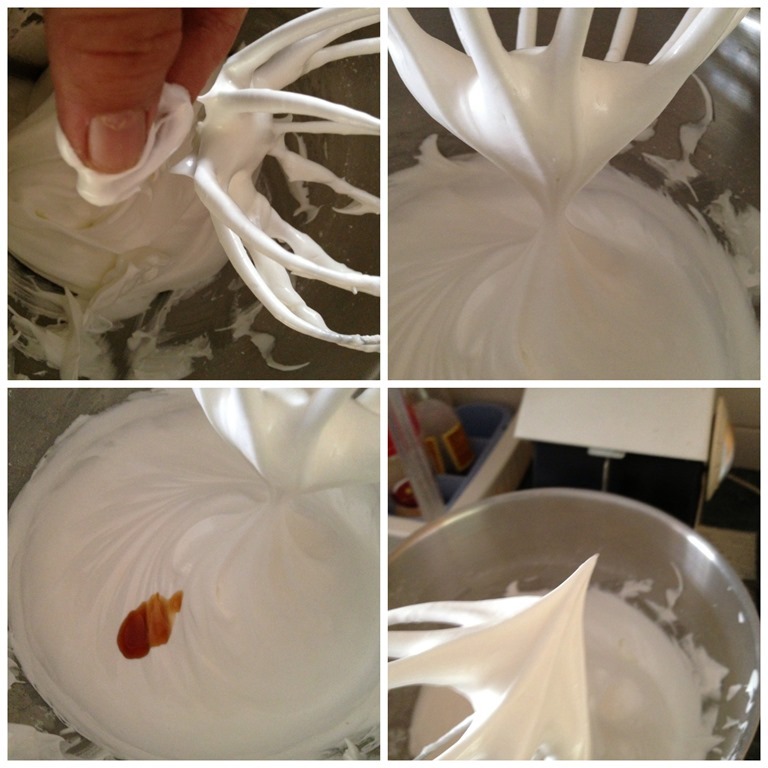 Stiff peak form means when you hold up the beater, the meringue can point upwards as shown in picture number 4. Take out the mixing bowl. Add/sprinkled the lemon juices. Sift in the potatoes/corn flours. Use a spatula to fold in the flour and lemon juice quickly. Handle lightly until all the lemon juice and flour are well mixed. 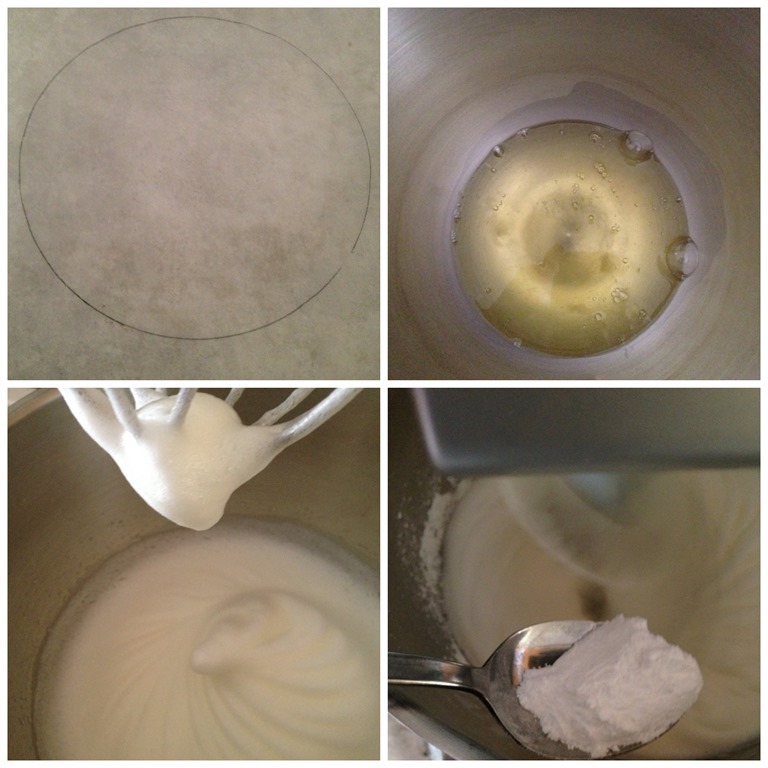 Place the meringue on top of the baking paper within the circle drawn. Smoothing the edges. Baked in the oven at low temperature of 130 degree Celsius for about 60-90 minutes or until the outer crust are dry and pale cream colour. IMPORTANT: Leave the Pavlova inside the oven with the door ajar and let it cool inside the oven until it is completely cool. It is generally okay if the middle part of the Pavlova collapsed as we will be decorating with whipped cream. PRIOR TO SERVING, beat about 200 ml of whipping cream until top peak and placed on top of the Pavlova. 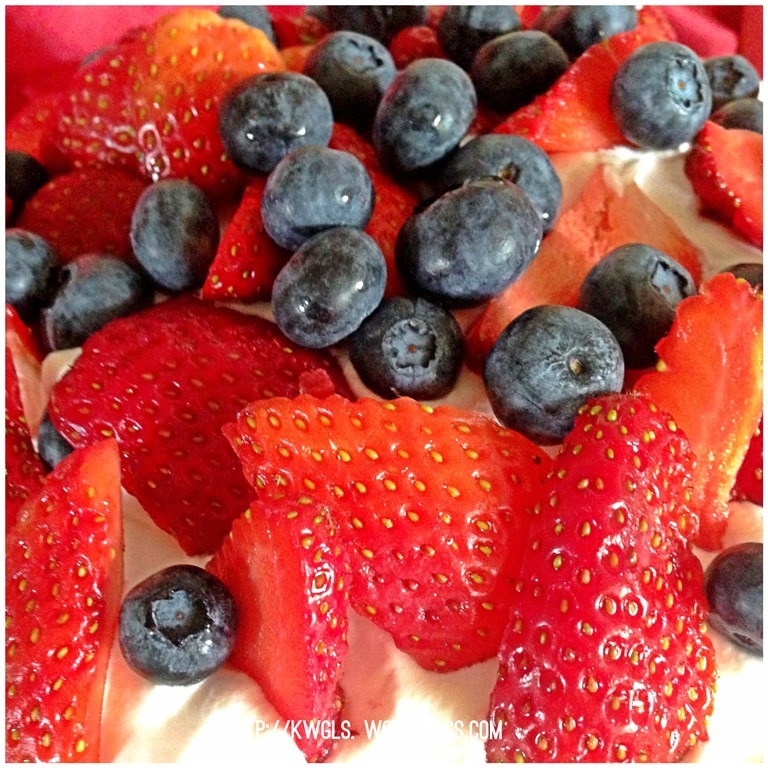 Place your fresh fruits on top of the Pavlova. 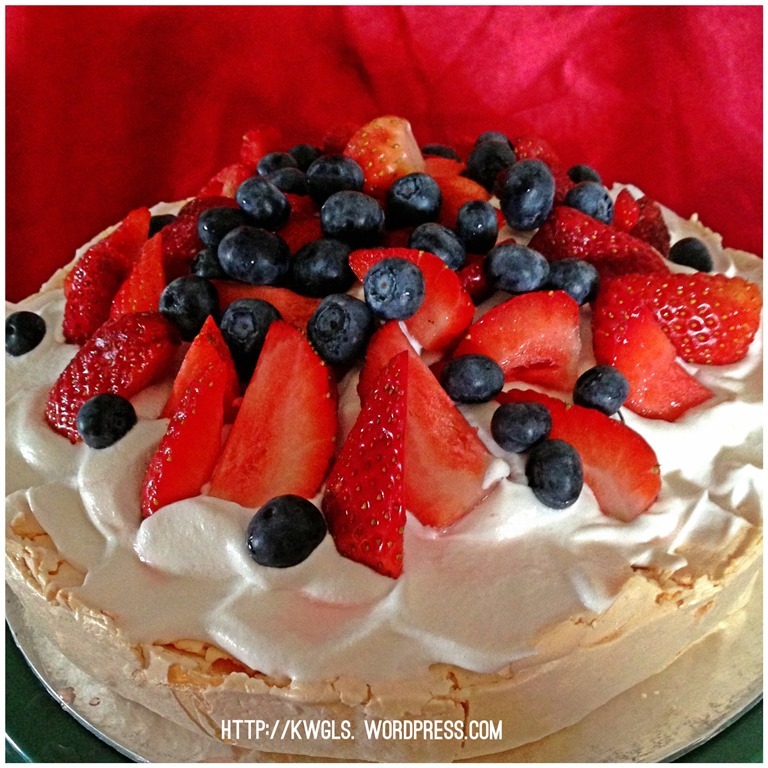 Pavlova is good to be served as a dessert. It’s sweet crusty tops and sides goes well with most fruits. One can also consider using fruits such as Kiwi and mangos. 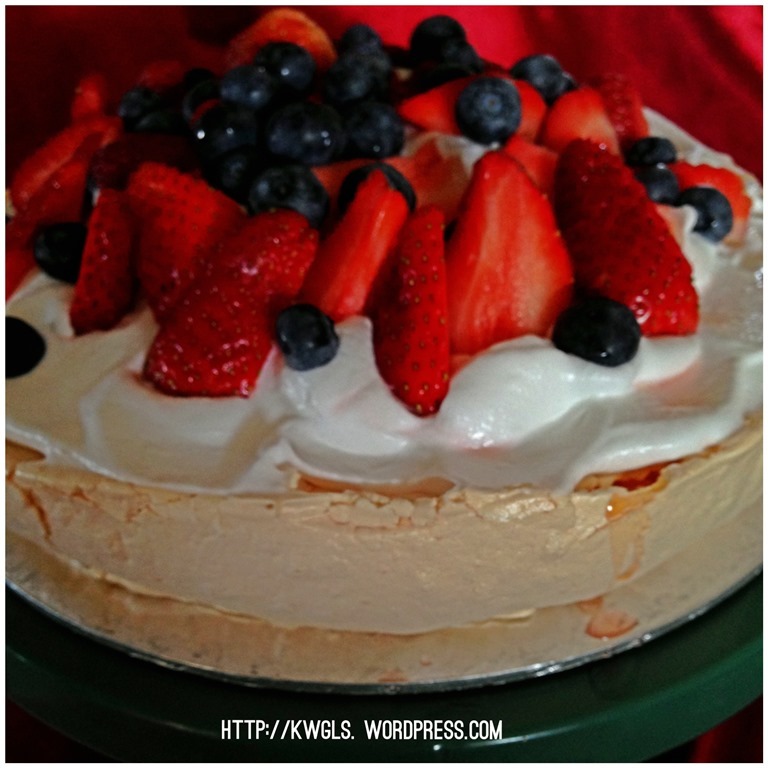 The Pavlova can be prepared in advance and keep for 3-4 days in an air tight container. Of course, the size of Pavlova have to be reduced accordingly for it to store in the container. It can also be made into a one bite size. If you are health conscious, you can substitute the whipped cream to low fat whipped cream and slightly reduce the amount of icing sugar used. Remember whipped cream and fruit toppings shall only be used prior to serving as the whipped cream and fruit juices will make the meringue soggy if not consume on time. Hope you like the post today and have a nice day. Cheers. I have mentioned before that my family members like buttery biscuits or cakes. 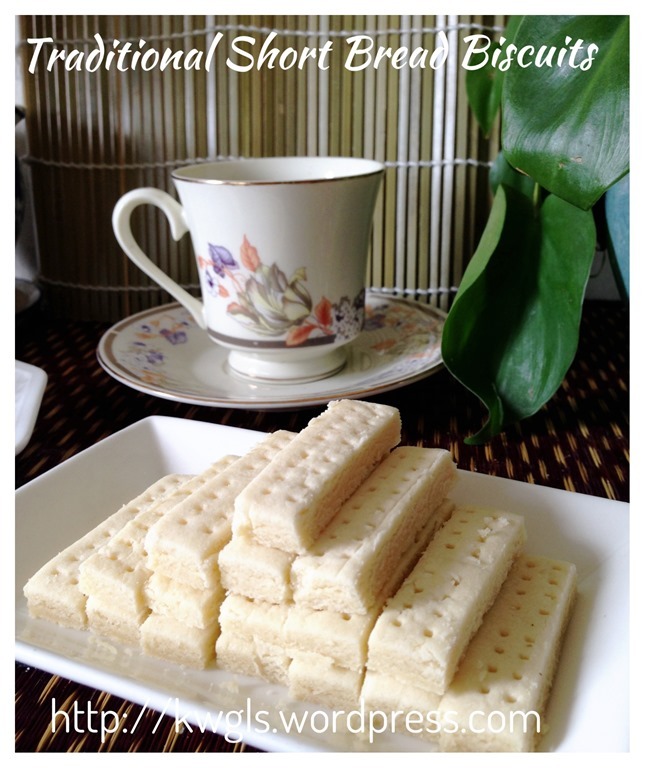 Butter cake without any flavour will definitely top my list of cakes whereas short bread will be my preferred choice of biscuits. 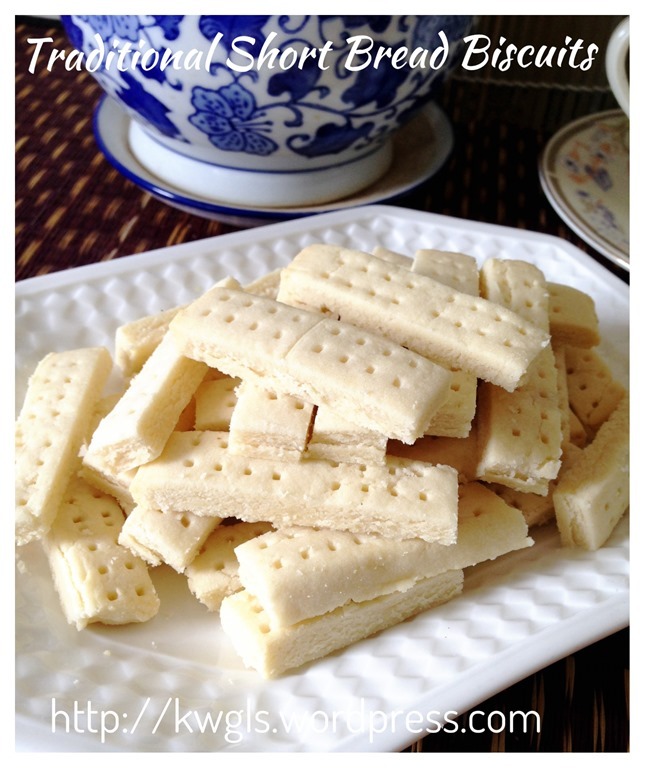 Short bread is crumbly in textures and full of buttery aroma and it is addictive as long as I started the first bite. 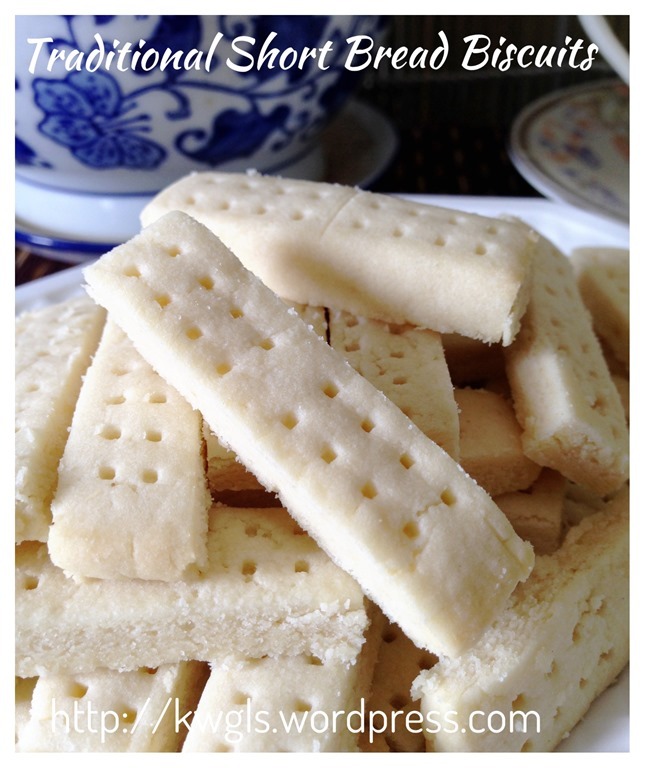 When I was searching for short crust pastry for my “short crust pastry moon cake” post, I remember wrongly and instead I searched for short bread. When I read the definition of Wikipedia, it immediately caught my attention. 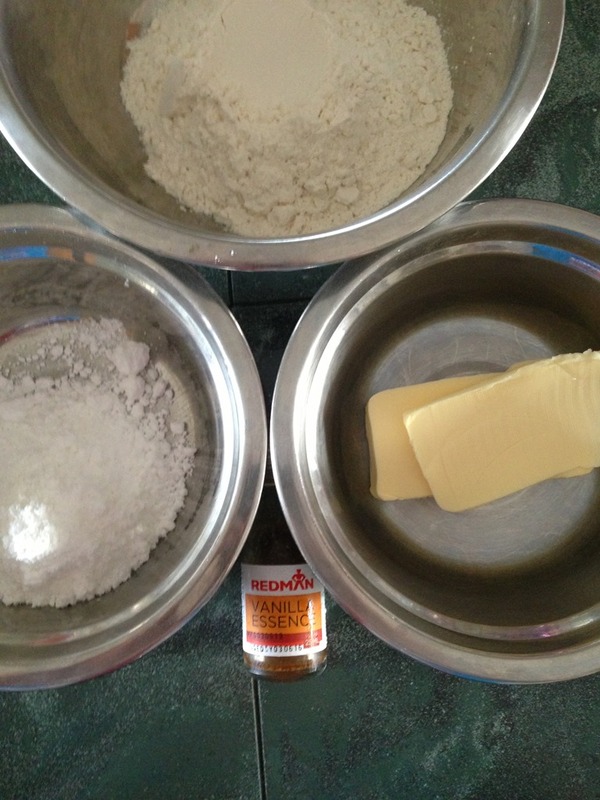 I was amazed by the simple ratio of one part white sugar, two parts butter and three parts of flour. 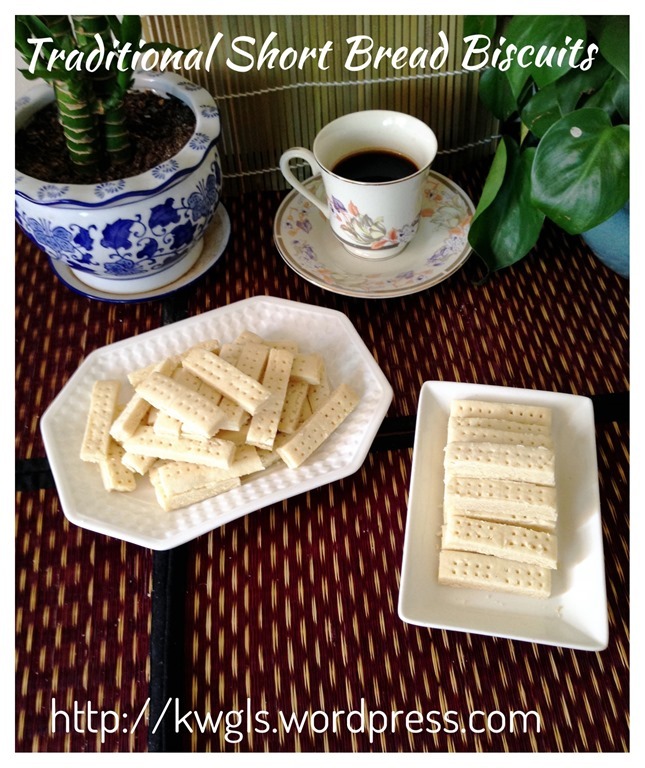 I did not look around for any further recipe and based on these three figures, I prepared my traditional style short bread. This is my first attempt and I am generally happy with the results though the shaping still needs improvement. I may try out other recipes in the net and compared the actual differences and what other special ingredients that were added to alter the texture. Preheat your oven to 180 165 degree Celsius. In a big mixing bowl, place cut butters, vanilla essence, icing sugar, plain flours. Mix and knead until it form a dough. 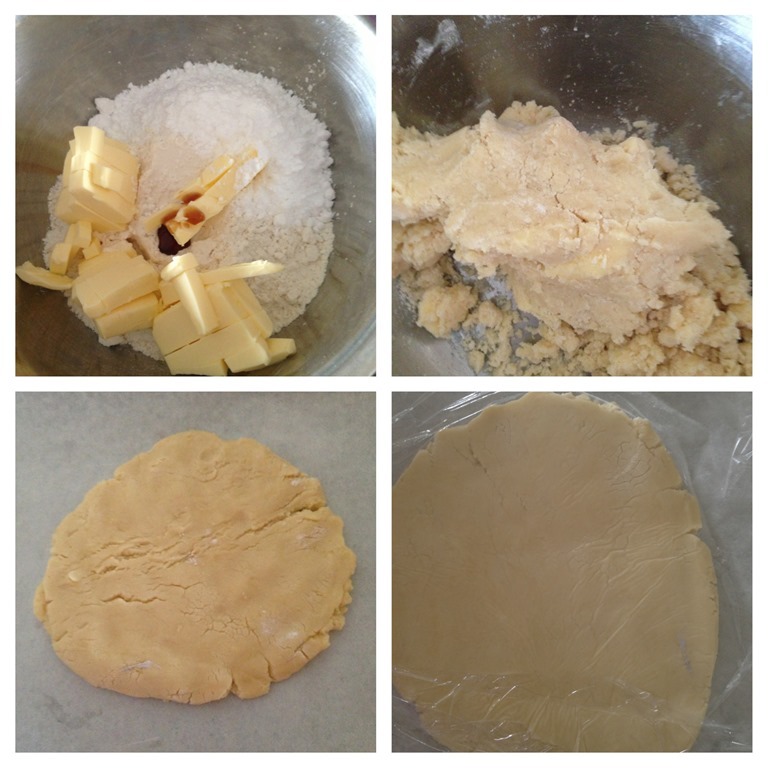 Use a rolling pin to roll the dough into a flat sheet of about 1 cm thick. Transfer to the baking tray with a sheet of baking paper. 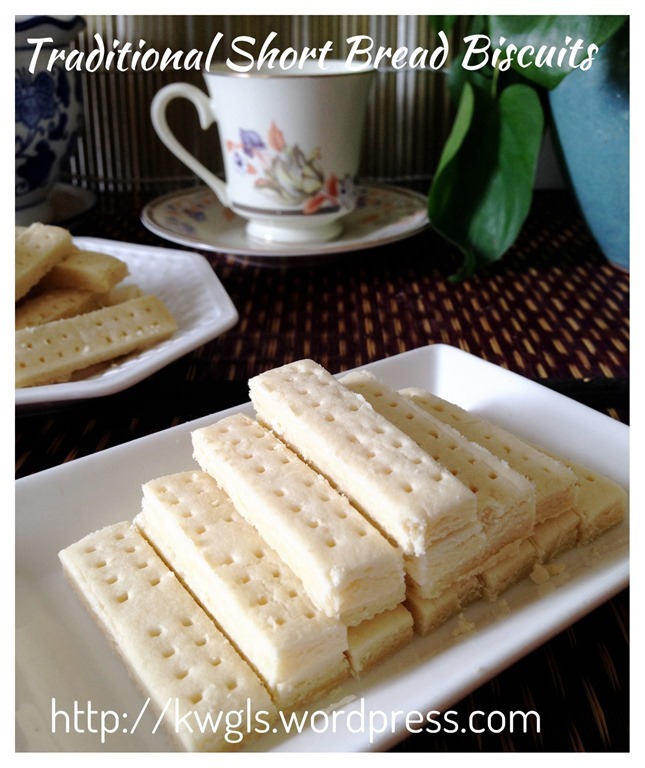 Place the short breads with adequate space to expand. 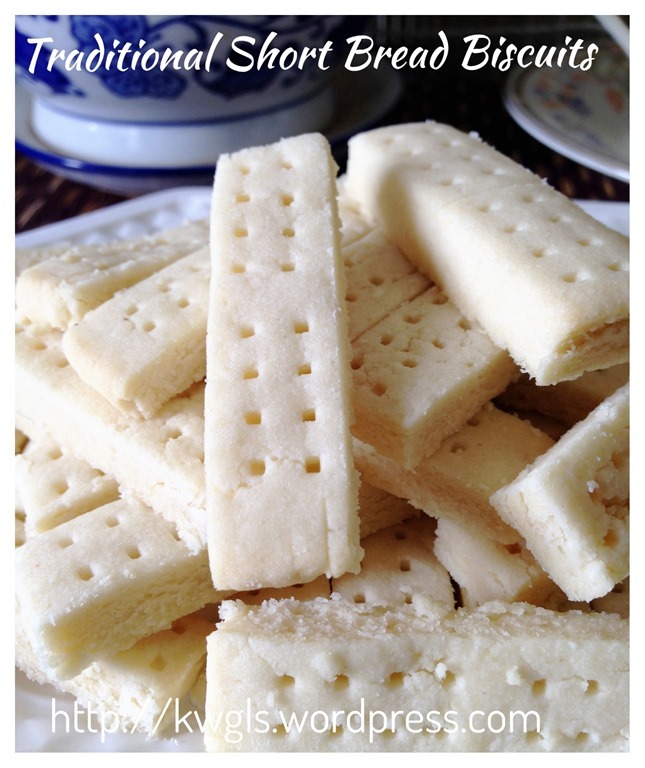 Use a fork or something sharp to make some holes on top of the short breads. Baked in the oven for 15 – 20 minutes until the colour start to turn golden yellow. You can chill the dough in the fridge for 15 minutes before your baking starts. 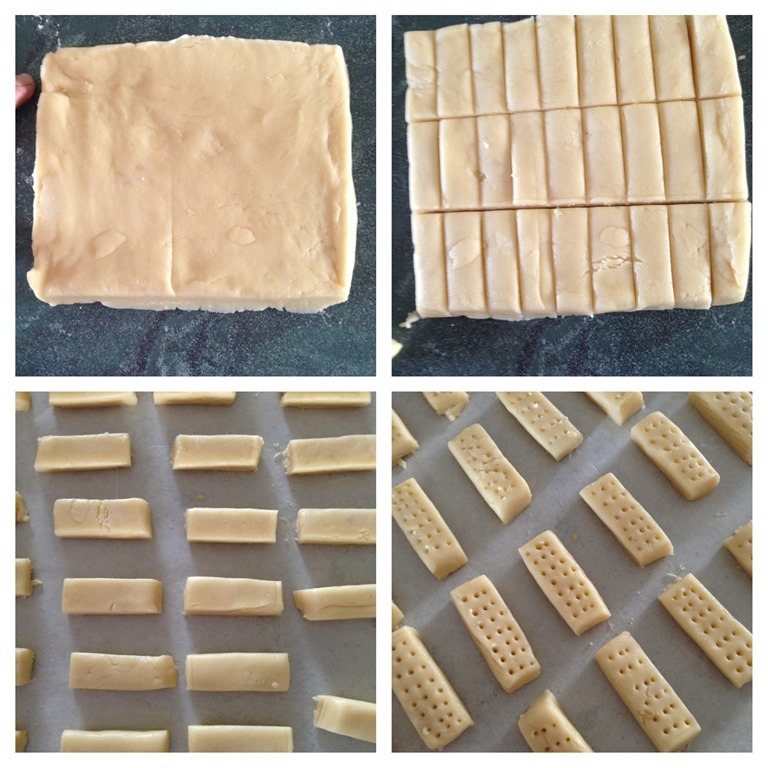 This will help to fix the shape of short bread! This illustration did not include the chilling. 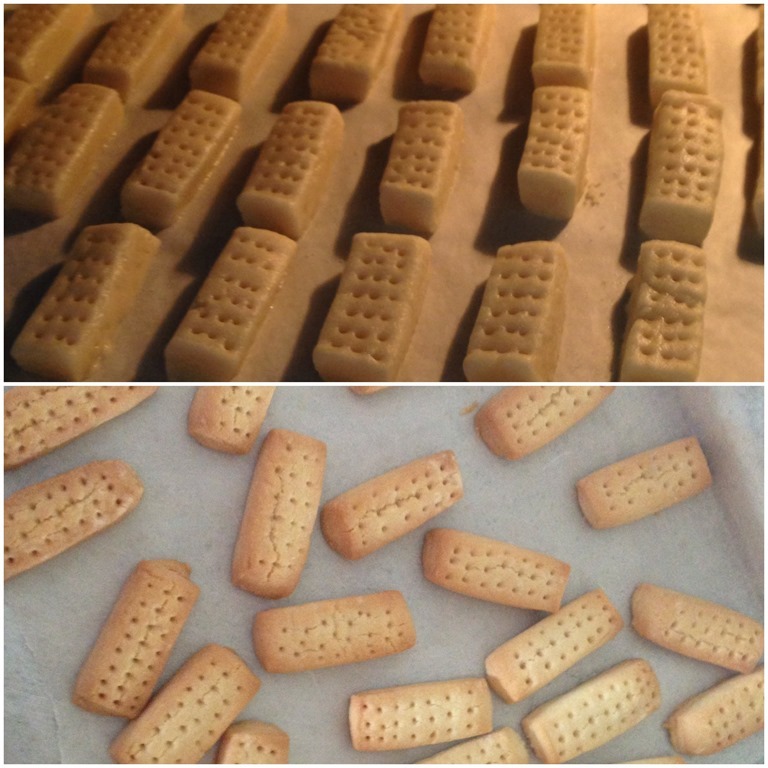 Due to the hot temperature in Singapore, The butter melts rather easily therefore chilling will hep to keep the biscuit in shape when you send for baking. A very short and straight forward post. I like this for its simple easy to remember recipe. This recipe is simply based on the traditional ratio of 1 sugar, 2 butter and 3 flour without additions of texture altering ingredients. The taste and texture is awesome except the shape is not as regular as what we bought from the stores. It will be an ideal gift for your friends during festive occasions such as Christmas. Overall, I am still very pleased with this adventure. 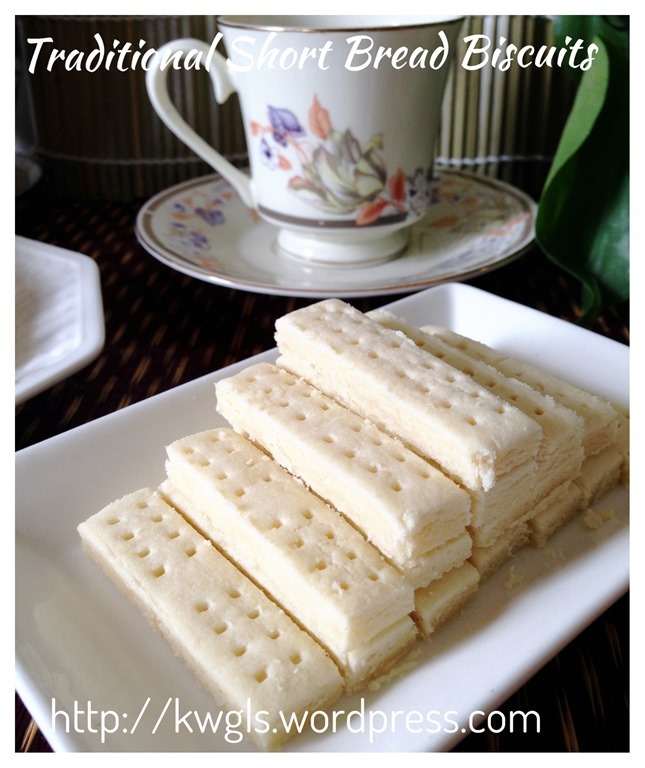 It is so simple yet we pay so much for these biscuits in the supermarkets. Try and you will know how easy it is. Hope you like the post today and have a nice day ahead. Cheers. 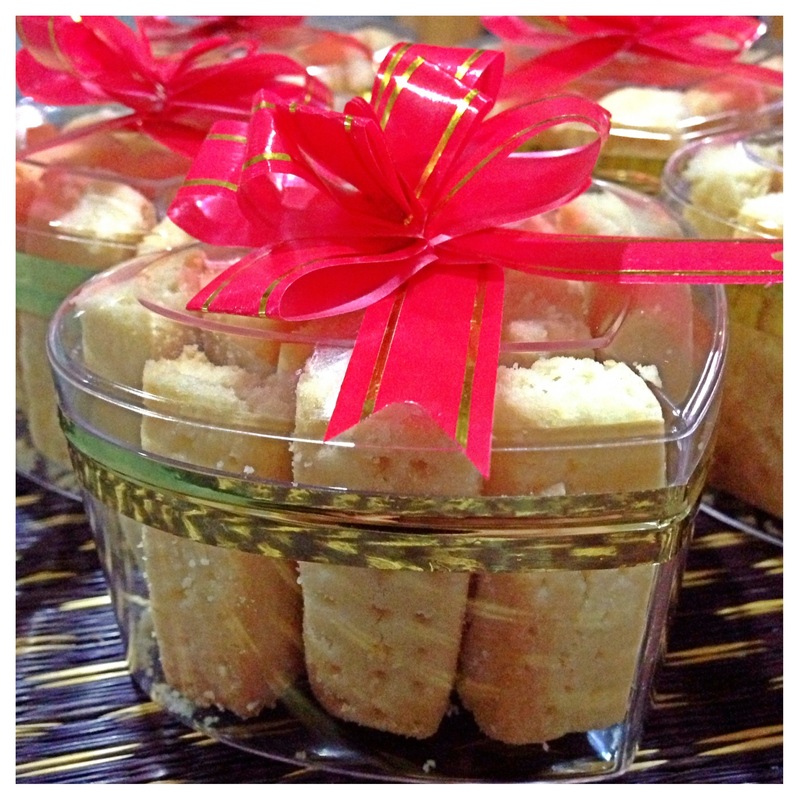 Second batch of short bread made for the celebration of Teacher’s day 2013. 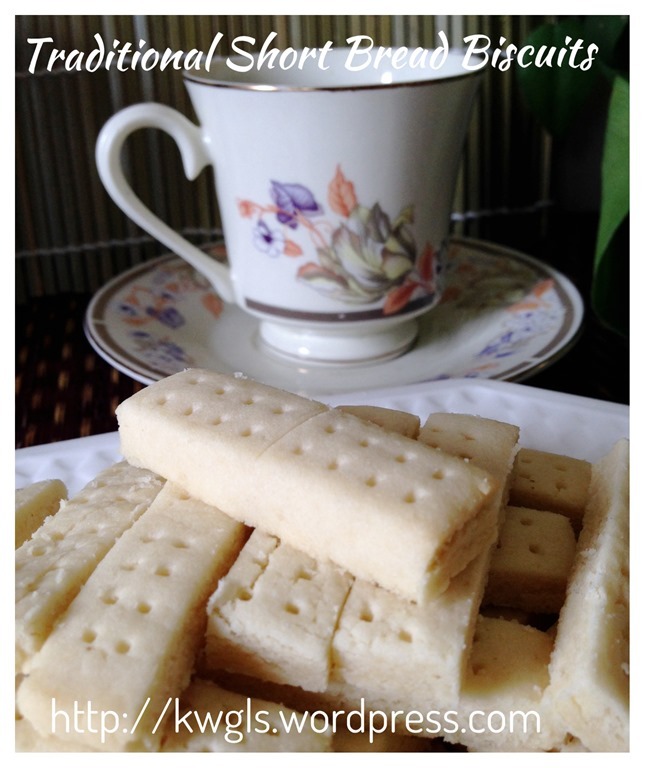 Baking this special batch of rose decorated shortbread biscuits. 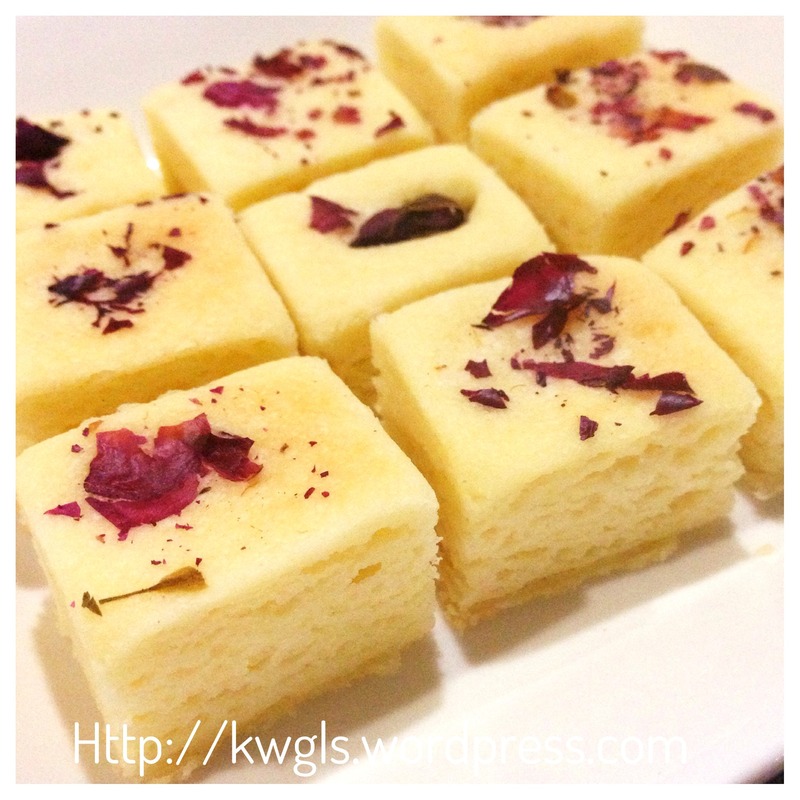 Recipe is the same except I cut it in difference shape and dust it with dried rose petals. 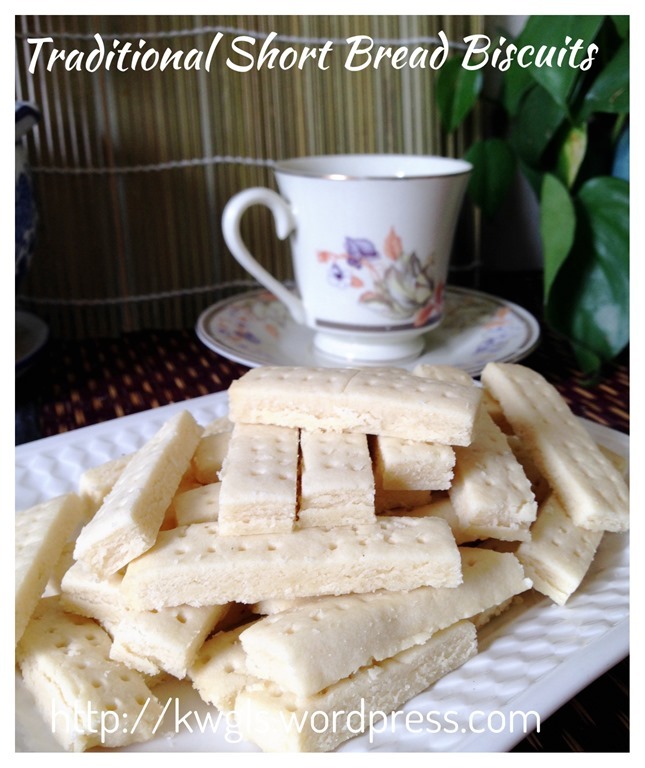 This recipe was included in Page 18 and Page 19 of the following E-book. For more Chinese New Year related cookies, snack and steamed cake recipes, you can have a copy of “Easy Chinese New Year Recipes – A step by step guide” that was packed with 30 recipes, 60 pages at a reasonable convenience fee of USD3.50. 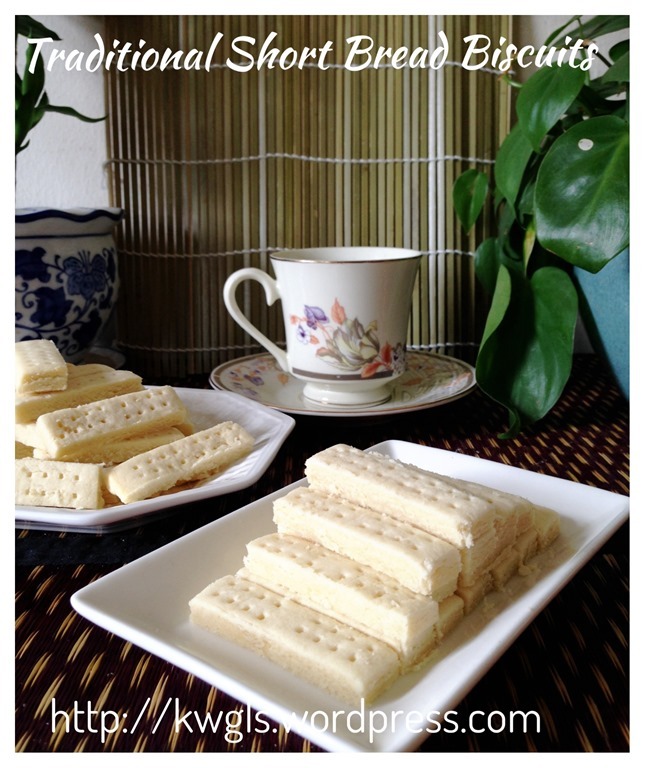 The recipes covered various recipes from auspicious radish cake to nian gao to traditional kuih bangkit to trendy London almond cookies. Of course not forgetting both type of pineapple tarts. You can purchase by clicking the link above. You can either pay using Pay Pal or Credit card account. Please ensure that you have an PDF reader like Acrobat or iBooks in your mobile phone or iPad if you intended to read it in your ipad or mobile phone. Should there be any problems of purchasing, feel free to contact me at kengls@singnet.com.sg and separate arrangement can be made. For more recipes, you can refer to my RECIPE INDEX (updated as at 26 November 2014) here and you can follow me at PINTEREST or visit the blog’s FACEBOOK PAGE to keep abreast of my future posts. Also follow me at INSTAGRAM or TSU, a new social network for some more personal sharing other than recipes. You can also join the FOOD BLOGGERS AND FOODIES UNITED FACEBOOK GROUP to see more recipes. Currently there are about 21,500 members sharing various food photos . I am posting my daily home cooked food in the above Facebook Group daily. I would be more than happy if you can post in the Group for the recipes that you tried from my blog. 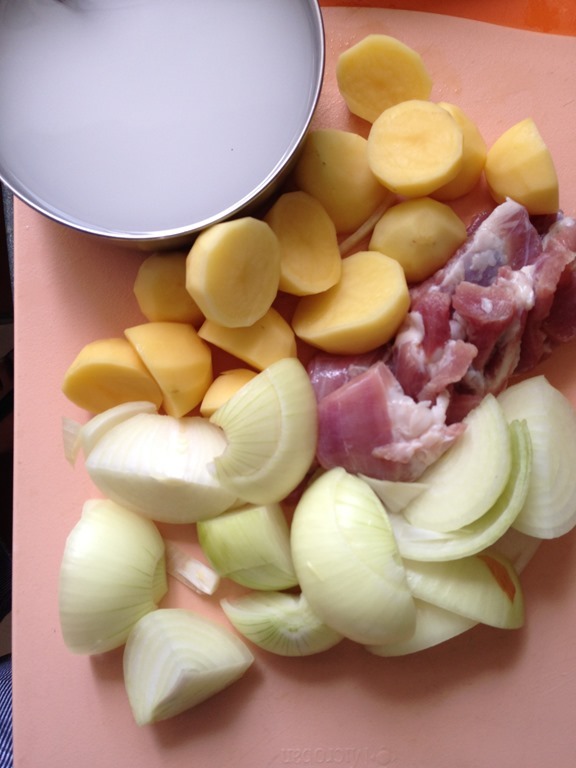 I have prepared the soup again today and have some new picture taking. However, today when I prepared the soup, as I am running out of time, I have decided to by pass the sautéing of the starch and onion. I put everything in the wok, boil until the meat is soft and add the starches. 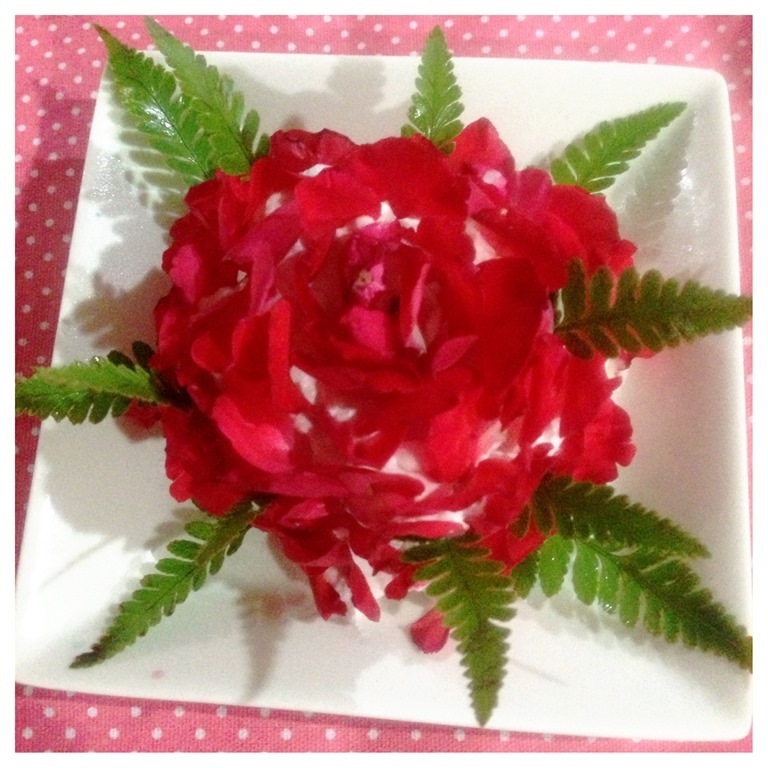 Of course, it was not as fragrant as what my father have prepared but it saves some times.. Kids start to like this starchy soup. Personally, I prefer the yam or taro version but shelve the idea as kids still dislike the taro. 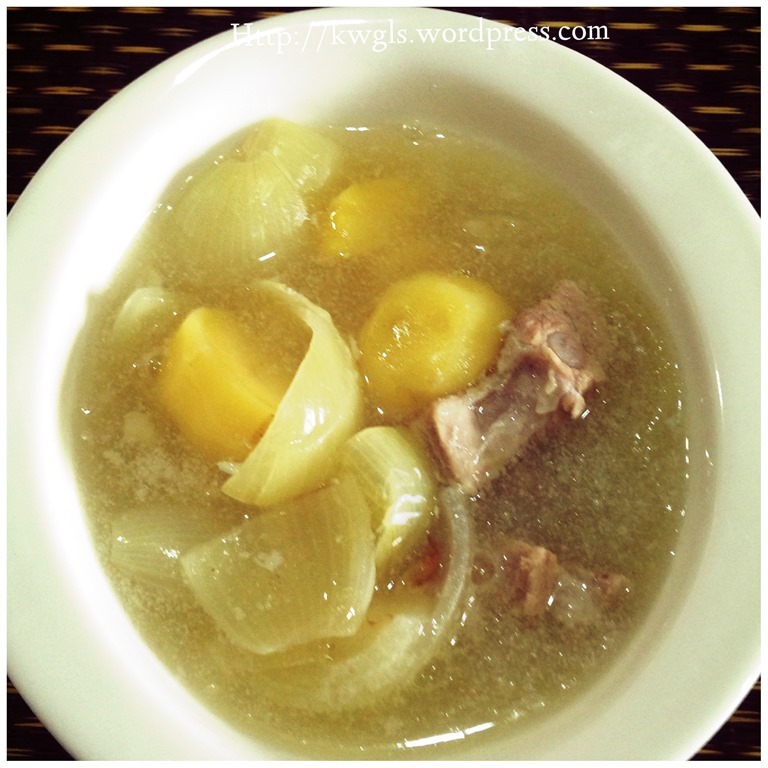 I seldom have soup recipe in this blog except salted vegetable duck soup, a well known traditional Chinese soup for Malaysian and Singaporean Chinese. 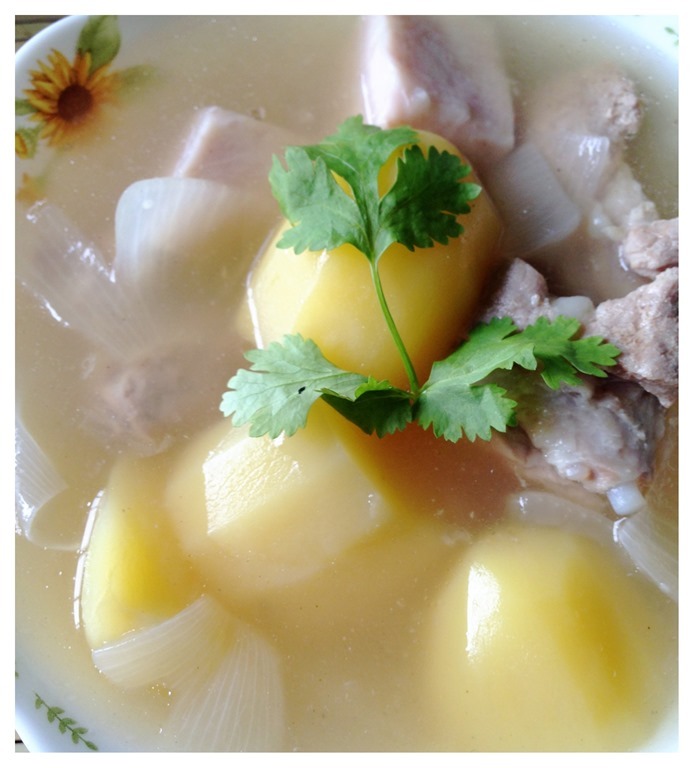 Of course I have many other soup preparation illustrations such as bitter gourd and pineapple pork rib soup, double mushroom chicken soup, sweet corn pork rib soup and many more at Guaishushu’s Facebook Page under the index start with “S”. 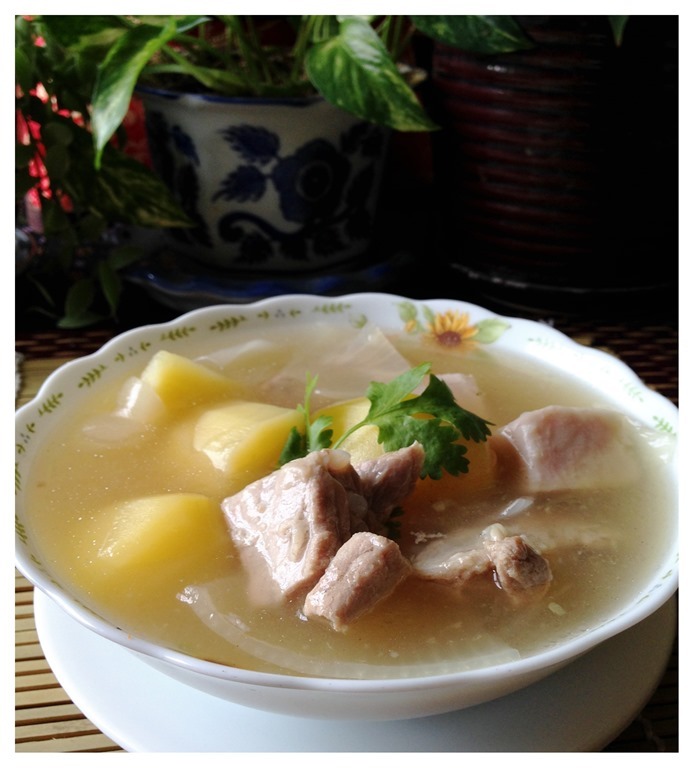 Today, I will share this special soup which is a comfort food with nostalgic and sentimental feelings for me. I am still in doubt its origins and totally unsure if other families are cooking this soup, not at least my circles of friends. It is hope that via this post, some readers will be able to tell me the origin of this soup! This is a “strange” soup cooked by my late father. 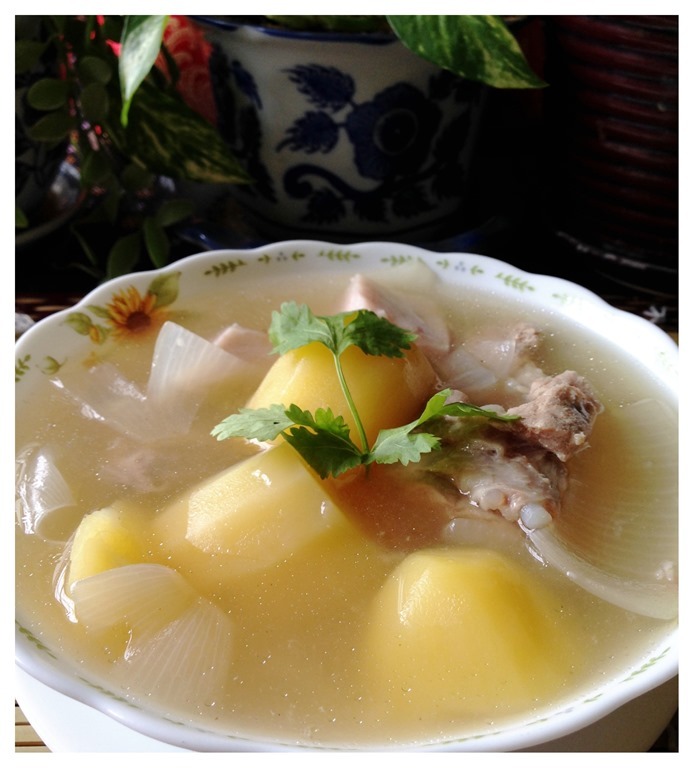 Not even my late mother cook this soup as she said it is a bit laborious to cook this soup. In fact, the ingredients and cooking method have influences of both oriental and western method of cooking. Talking about this soup, I am sure my brothers and sister in laws can recall about the soup. It can either be cooked with taro or potatoes. 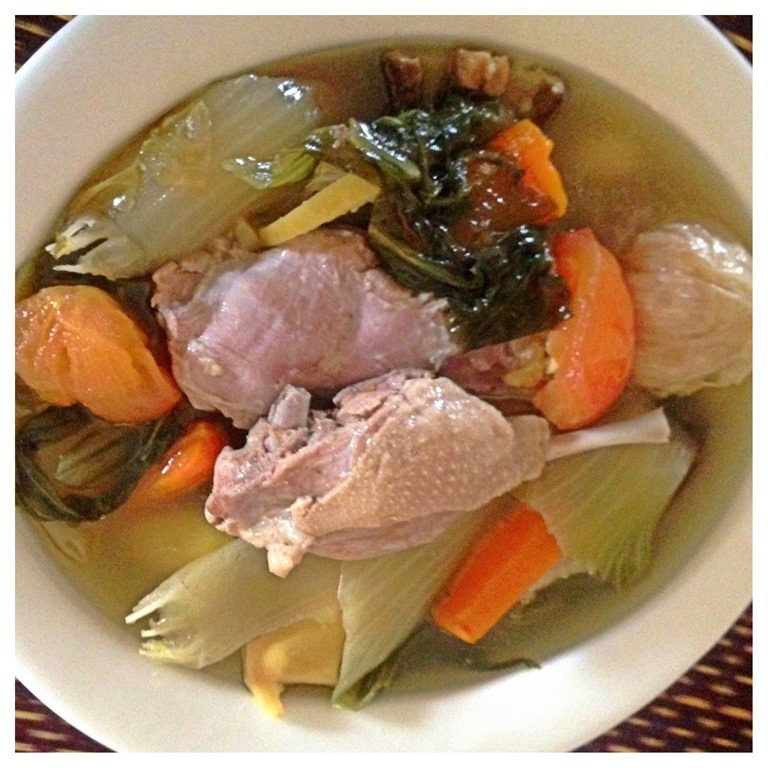 What we usually cooked is with yam or taro and I knew my sister in laws still cook the taro version of this soup as at today. The potato version of soup what is always in my mind. When I told my mother in law that I wanted to cook this soup, she looked at me unbelievably and she thought that I am cooking ABC soup, a soup that were cooked using carrot, potatoes and onions. I told her no, it is a pure potatoes soup! 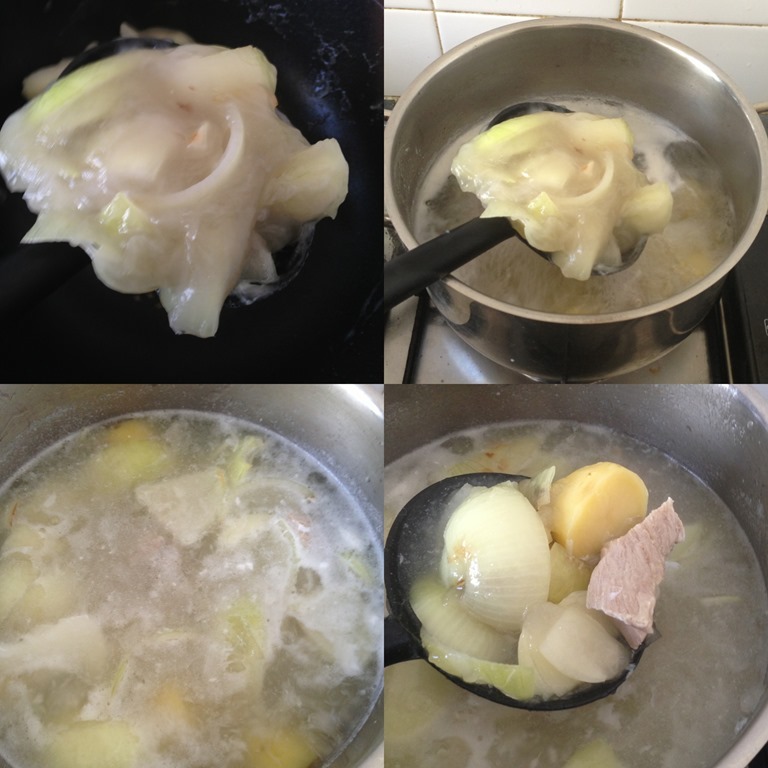 In a big soup pot that can accommodate at least 10 cups of water, put some water adequate to cover the pork ribs. Blanch the pork ribs until the outer layers is slight cooked. Throw away the water. 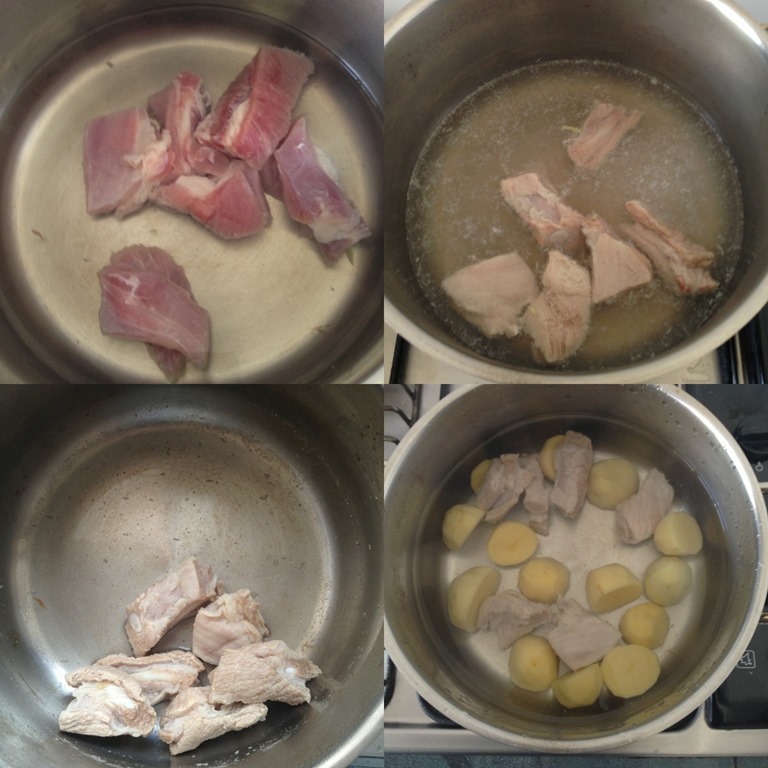 Wash the pork ribs under running water to get rid of any blood clots and add in the cut potatoes. Add in 6 cups of water and bring to boil under high heat. 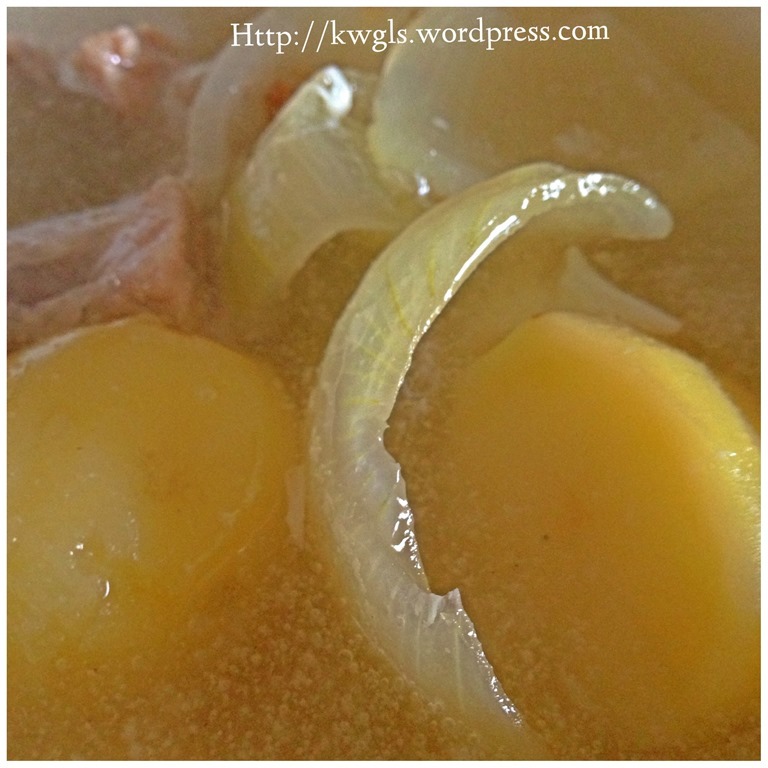 Once boiled, turn to medium heat and continue boiling until the potatoes and meats are soft. This will take 15-20 minutes. You can just let it boil until your next step is ready. Change to low heat if necessary. 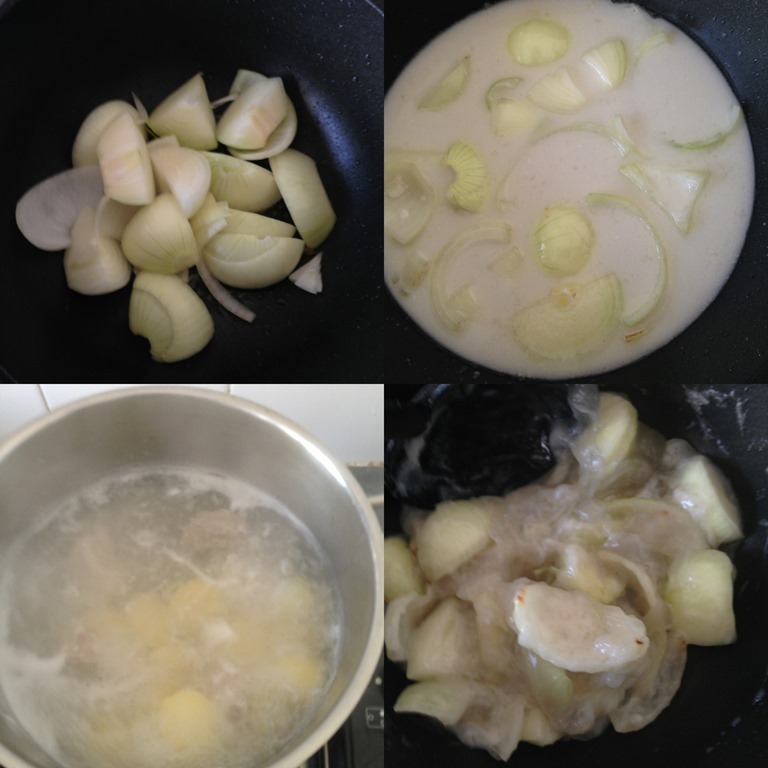 In another sauce pan, add in 1 tablespoon of oil, add in the cut onions and fried until the fragrance of onion start to spread. Put in the sweet potatoes starch and cook under low heat, Stir fry until the flour turned into a lump and become colourless. Note that the main reason of cooking this way is to give the flour some flavour of onions. If you add directly to the soup, you will find the flour in the soup is flavourless. Well that is how my late father cooked and I do agree to it. 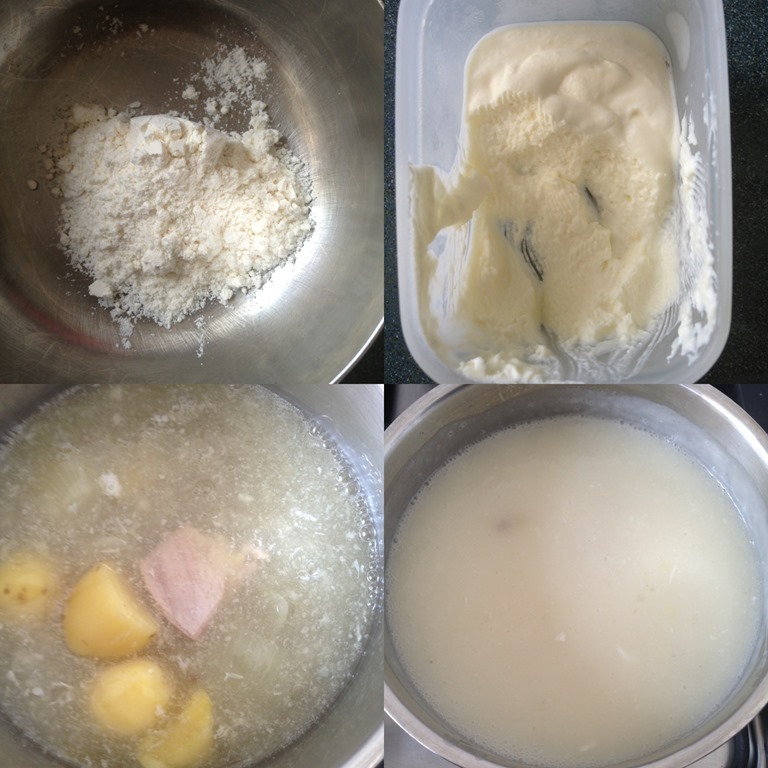 Transfer your cooked starch to the soup and continue boiling until the meat and potatoes of your desired textures. Add seasonings of your choice (flavour enhancer such as mushroom concentrate, pepper, salt, light soya sauce etc.). Bring to boil and once boiled, off the heat and garnish with herbs of your choice. Preferably served hot with rice. WHY THIS SOUP IS UNIQUE? 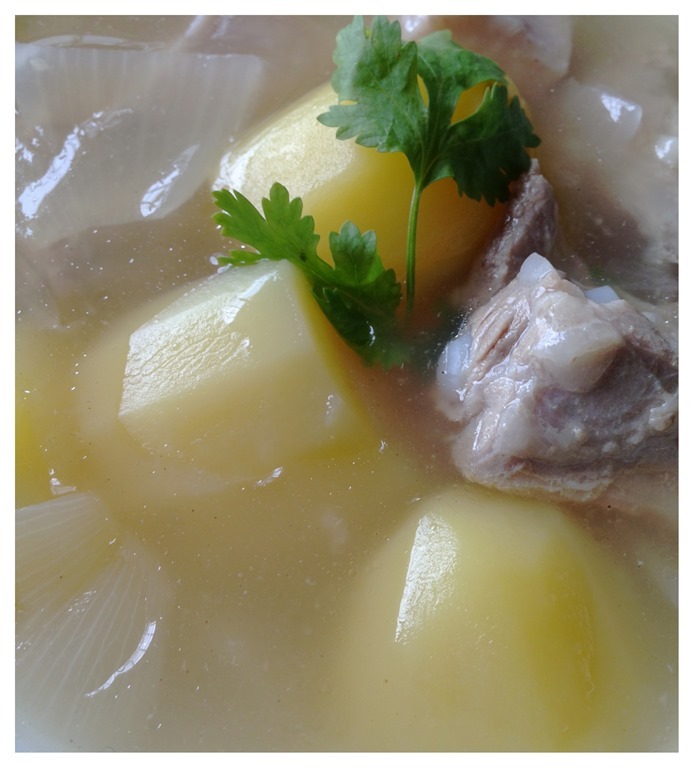 The soup has the oriental elements because it is cooked with normal cooking oils used by Chinese home cooking (instead of butter or olive oils) and pork ribs and flavour using the Chinese condiments. In addition, the thickening is using Chinese cooking ingredients sweet potatoes starch. It is definitely more watery and less creamy than Western soup! 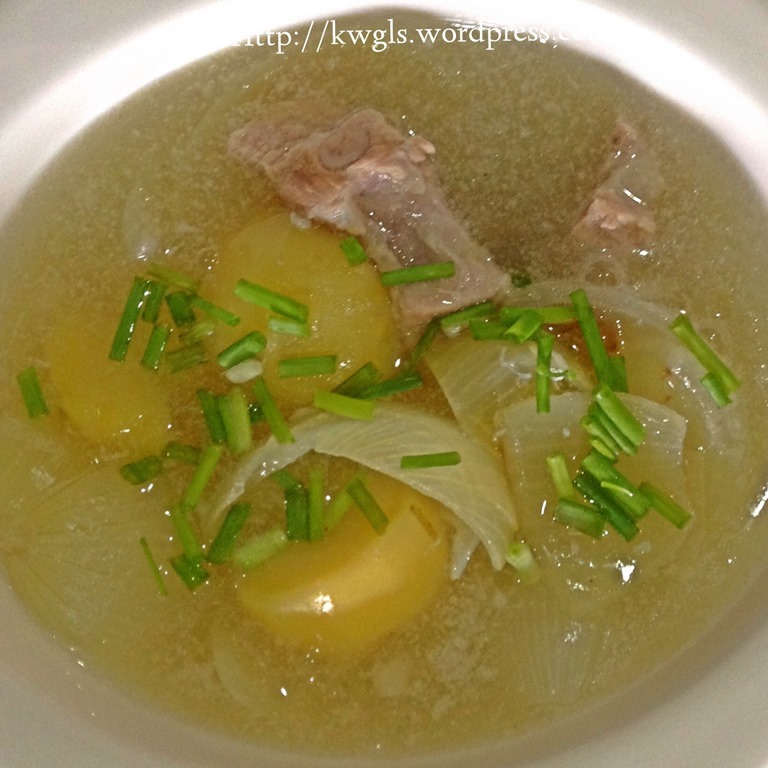 The final soup still maintain the shape of the potatoes, pork ribs and even onions. It complements the dryness of the white rice. 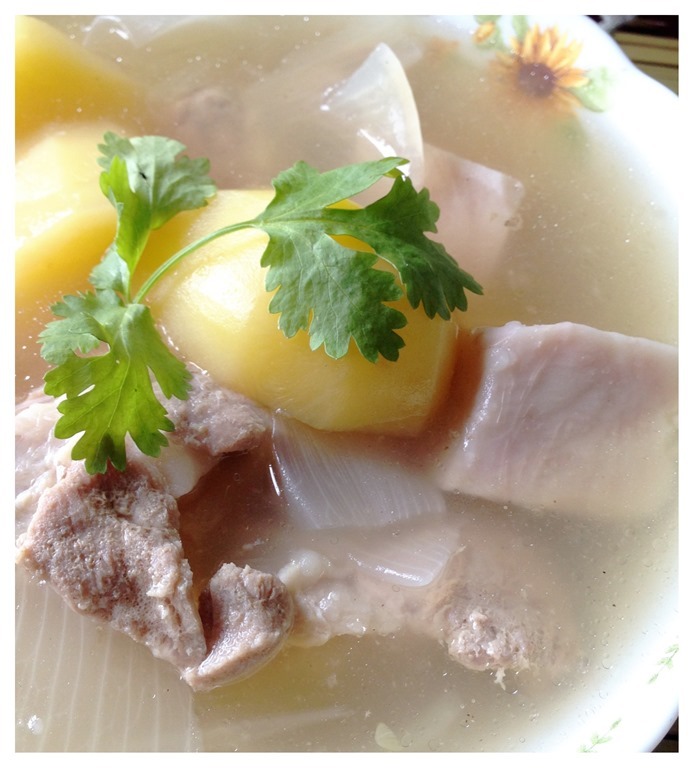 On the other hand, it is unusual for Chinese to use potatoes to cook soup. 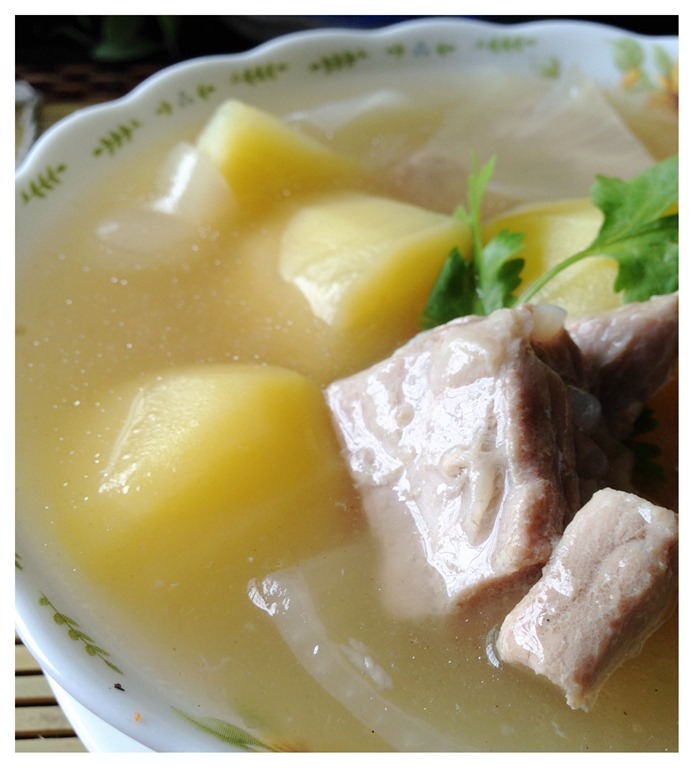 Besides ABC soup, most Chinese households do not use potatoes to cook soup. Besides this unusual ingredient, Chinese soups usually do not use thickening agents in soup with the exception of some special soups such as shark fin soups and sweet and sour soups. 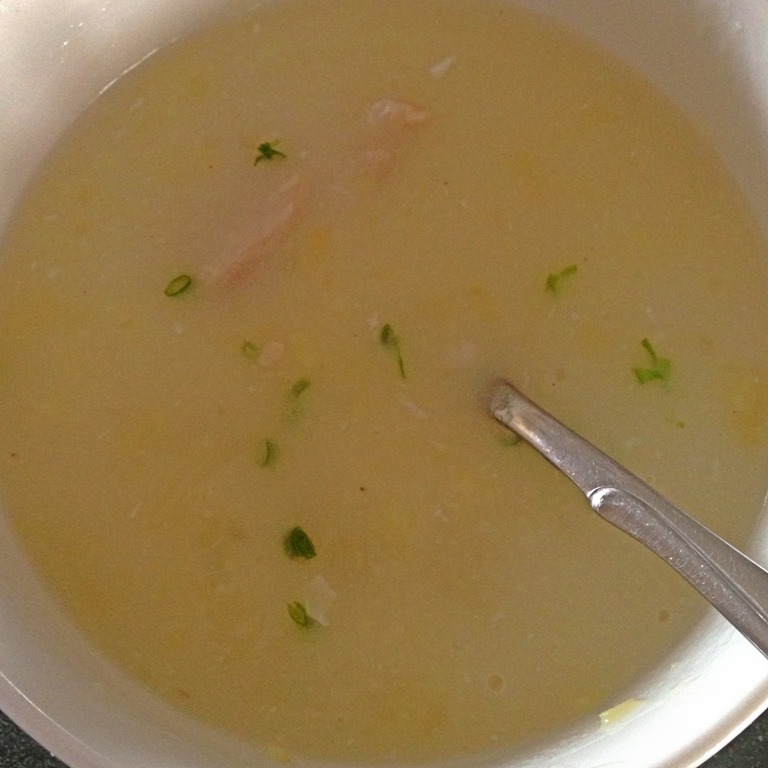 The soups, in traditional sense should be watery and clear (or whitish colour due to the meat essence in the both). Thickening agents are used in many Chinese dishes including braised dishes, noodle dishes , vegetables dishes, egg dishes, bean curd dishes but not in soup dishes. For purposes of further illustrating this soup may have Western influences, I have took out portion of the soup and added plain flour (wheat flour as you used for making cakes) and some creams. This is what the end product looked like and in fact, my kids do not mind this soup after adding of cream and wheat flour. My boy says that the soup is very creamy like cream of mushroom soup that he used to have in Western restaurant. 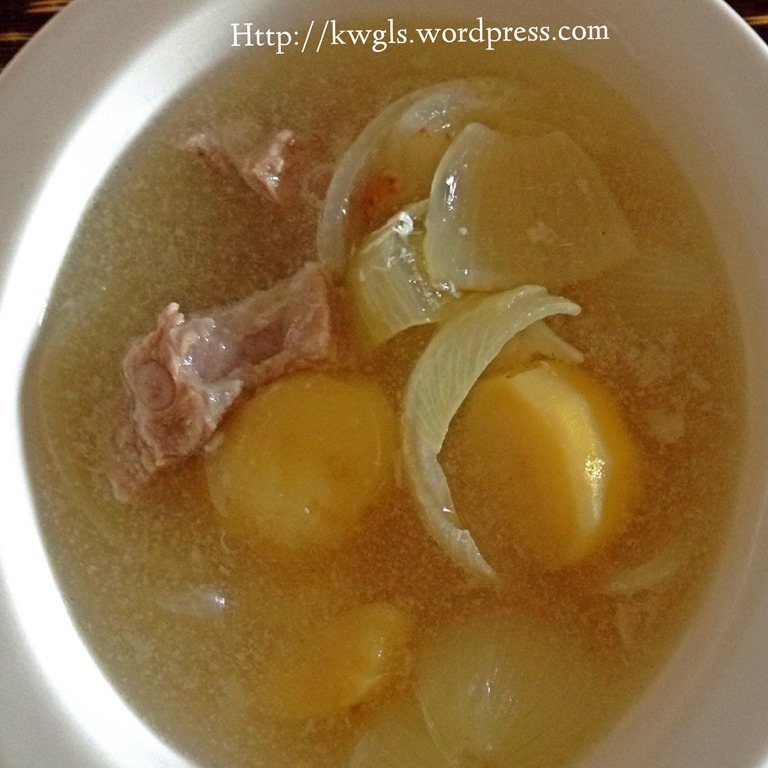 Having a post on this particular soup brings me lots of fond memories and sentimental feelings, making me wanted to know more about my late father. We did not really communicate much due to very traditional Chinese family upbringings whereby we were not encouraged to ask about what the adults are doing. Communication was always unidirectional. However, if he was still available, I would know how to tackle the issue and “fished” out his thoughts! It is a soup that none of friends knew. It is neither Western or Oriental style of soup. It is a mixture of both. Where my late father learned the cooking of this soup was really a mystery (in my humble opinion). He hailed from China and could not read or spoke ABC not to mention exposure to Western cuisines. The only remote reason that I could think of was due the influence of British colonization of Sarawak until late 1940’s and at that time, he was a teen. Hopefully by having this post, some of my readers from any parts of the world can share with me, if you have ever tasted exactly soup cooked in this manner and what do you think is the origin of the soup. 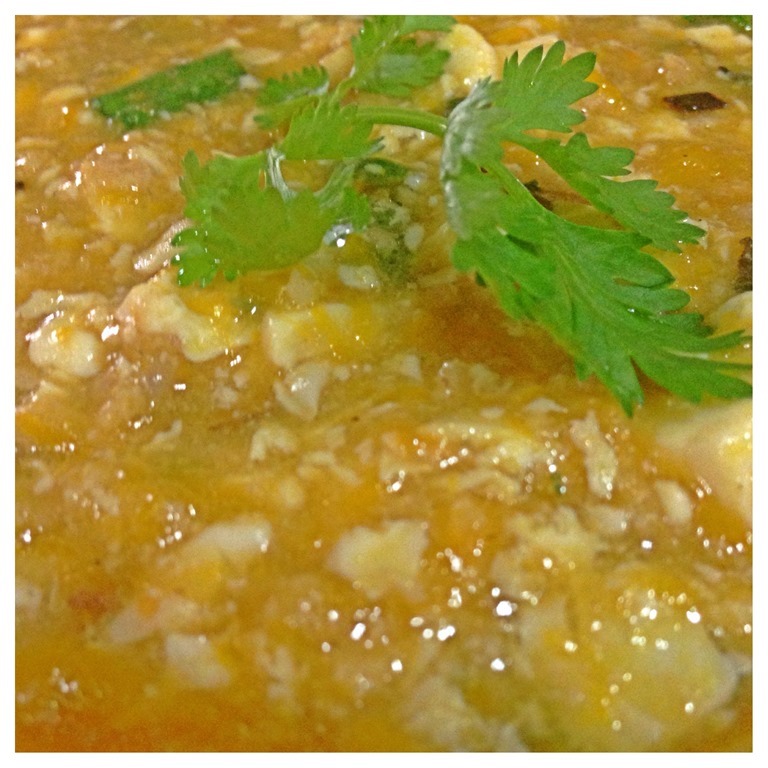 It is also hope that my readers will try out this soup and let me know if it suits your taste buds. Thanks and have a nice day. For more recipes, you can refer to my RECIPE INDEX (updated as at 8 June 2014) here and you can follow me at PINTEREST or visit the blog’s FACEBOOK PAGE to keep abreast of my future posts. You can also join the FOOD BLOGGERS AND FOODIES UNITED FACEBOOK GROUP to see more recipes. Currently there are about 11,500 members sharing various food photos . I am posting my daily home cooked food in the above Facebook Group daily. I would be more than happy if you can post in the Group for the recipes that you tried from my blog. You may be surprised about this title! In fact, the title is not correct either. What I am going to post is not “what I cooked today” or “what I ate today”. 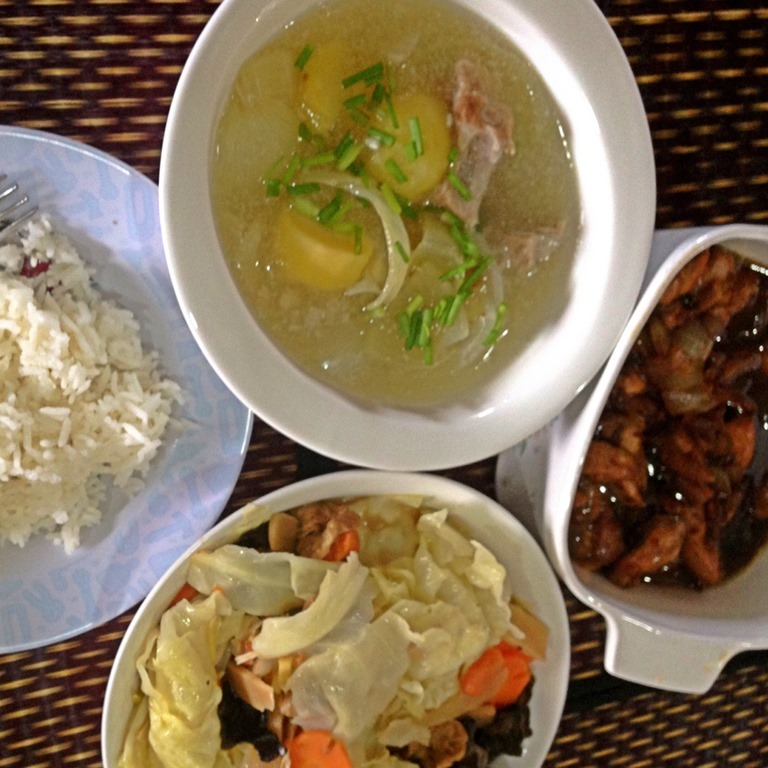 It was a gathering at one of my relative’s house and she had cooked some Chinese dishes that are not common among Fujian or Guangdong Province. 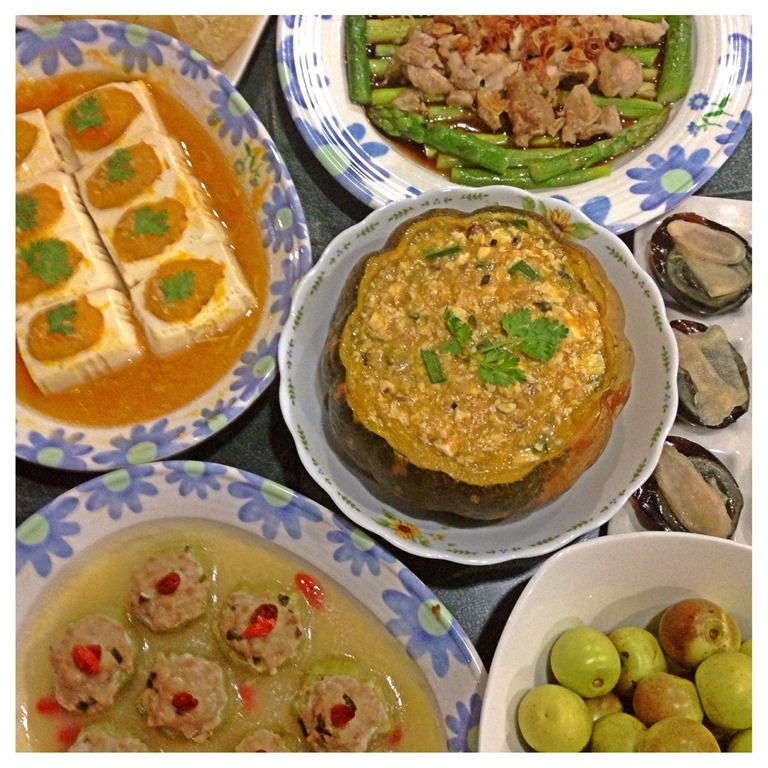 My relative is from Jiangxi Province and therefore the food that she cooked were rather different! As you all know, Singaporean and Malaysian Chinese are descendants of immigrants mainly from the South Eastern Coastal Fujian and Guangdong Province. 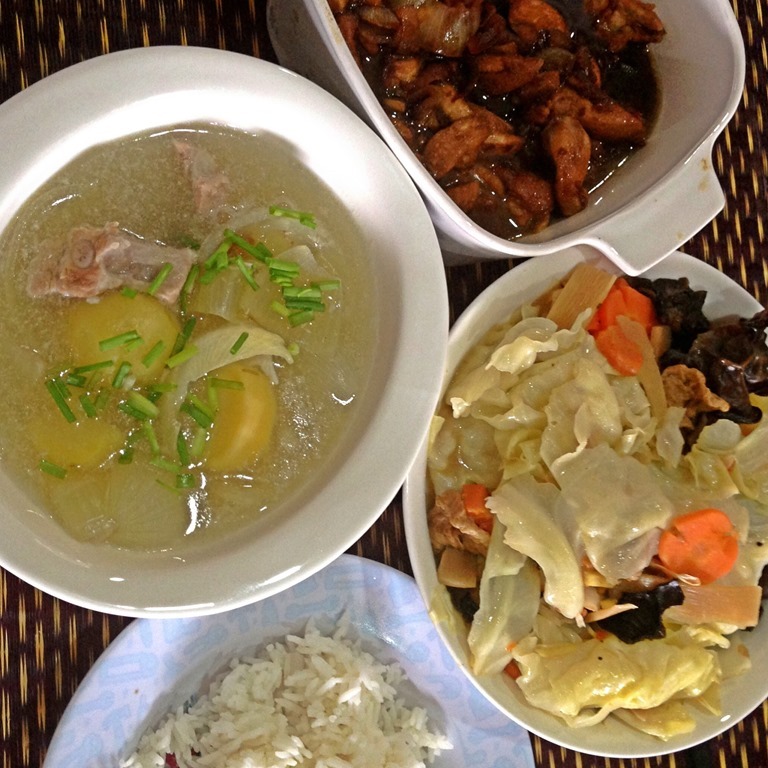 As compared to Nanyang Chinese (Malaysian and Singaporean Chinese), in a household meal, they are more dishes but with a smaller portion. 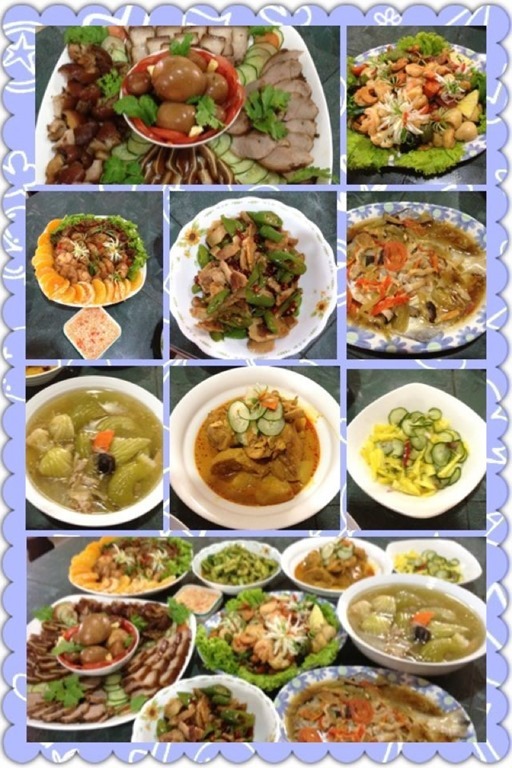 For us, we will usually serve 3 dishes and 1 soup, for them the dishes can be as many as 6-12 dishes. 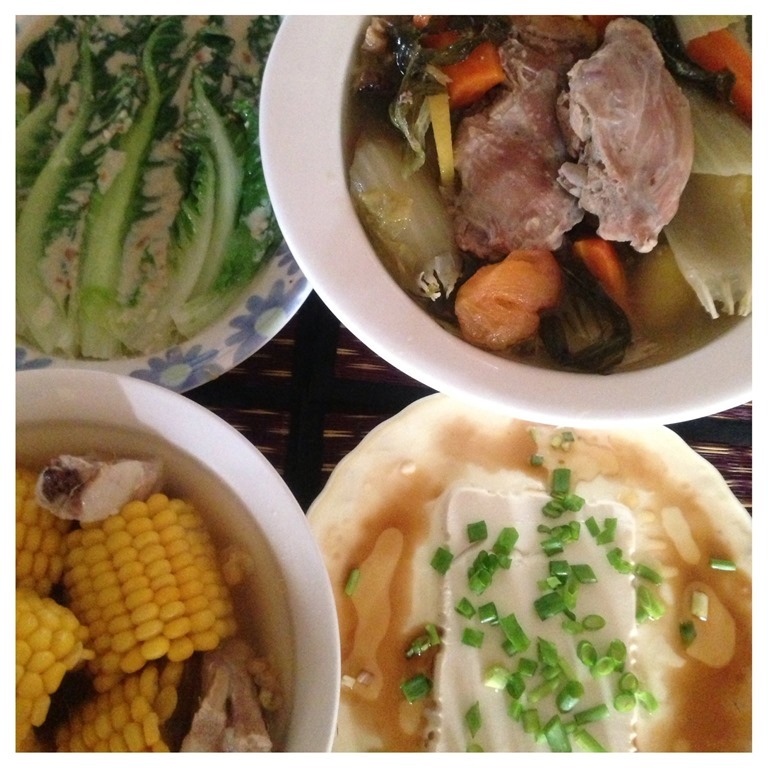 Today, the host is kind enough to cook us 7 dishes (excluding desserts and sweet soups). Jiangxi dishes were rather spicy (chilli hot) and as my kids were having meals with us, for some dishes, they have to prepare both the spicy and non spicy version. Note than I am currently on a vegetarian diet and since I did not told them in advance, I have taken my meals before joining them. Therefore, I did not join them for meals. Yes, this is my favourite. Potatoes were julienned into thin strips. There were then soaked in cold water until all the starch were gone. This will make the potatoes “crunchy” and water have to be changed regularly. Look at the thin strips, these were all manually done. They were then stir fried with spring onions, black vinegars and chilli. This is something that I have yet to share the cooking illustrations with readers but I can assure you it is something simple yet the taste is superb. Kids are fighting for this. I do not know if there is any translation of this dish. 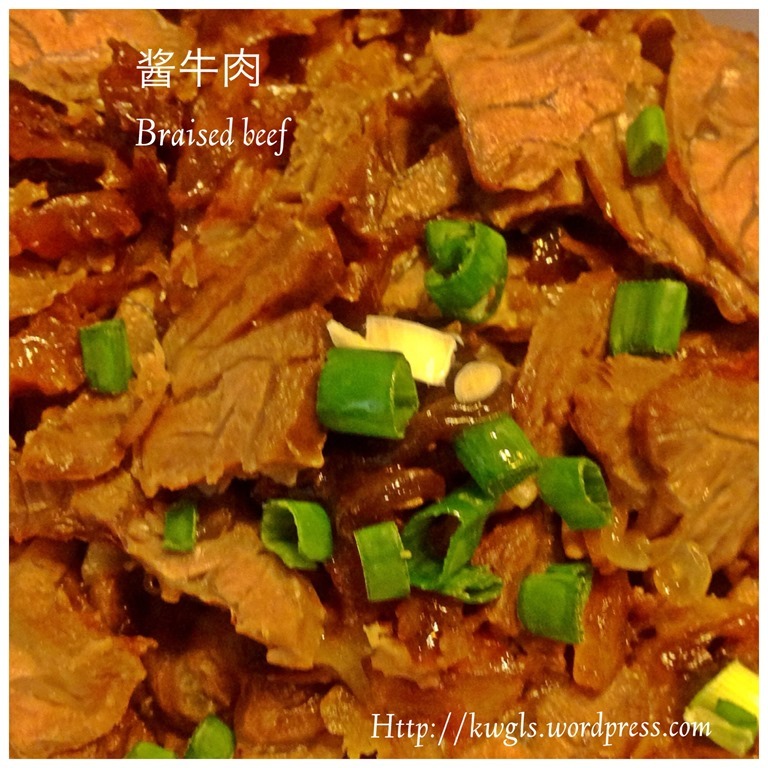 It is basically beef braised in dark soya sauce (and herbs and spices). It was then air dried. If it was kiln dried, it will become smoked beef. 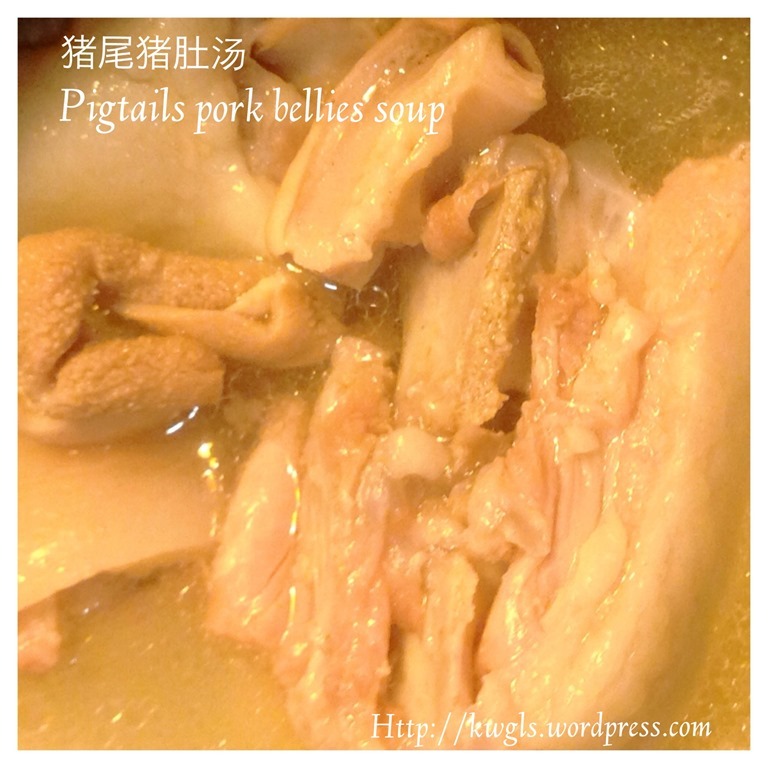 This is a form of meat preservation that can be commonly found in many parts of China. My relatives have prepared these meat in China and brought it over. I still remembered when I was stationed in Changchun, China about 10 years ago, one of the past time is to buy some braised chicken drumsticks and ate it in the hotel. It is delicious and thinking about it make me drooling. Depending on the regions, the preservations can be sugar based or salt based. 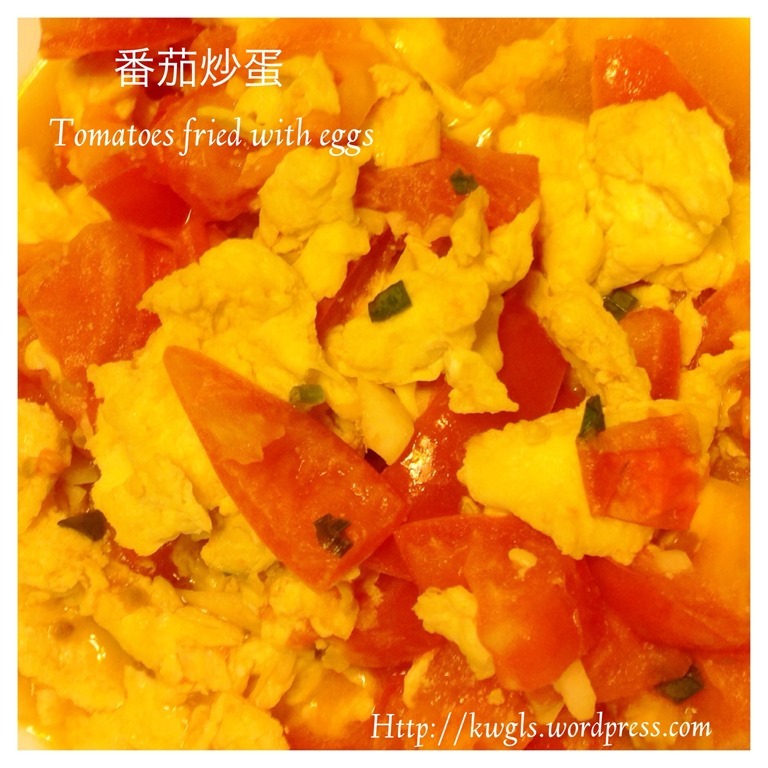 A common household dish in China. Besides stir frying, another way of cooking this combination is making it into a soup. Tomato is not a common vegetable in my traditional house cooking. Tomatoes are considered vegetables imported from other countries (though this may not be true any more). 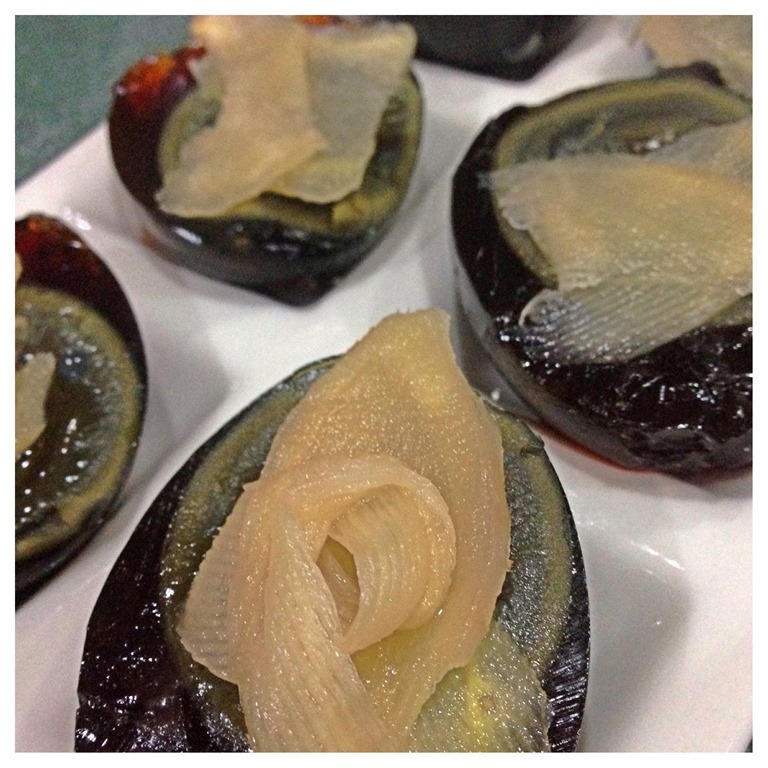 This is evidenced in its Chinese name literately translated as Western Persimmon (西红柿）or Foreign brinjal (番茄）。In Hokkien dialects, it was called Caucasian Brinjal (angmokio)! Therefore, my mom seldom cooked tomatoes in the house. The Chinese sausages were prepared by my relatives in China and brought it over. You can hardly find any fats in the Chinese sausages. Before I am on my vegetarian diet, I have tried the sausages before and it is delicious. 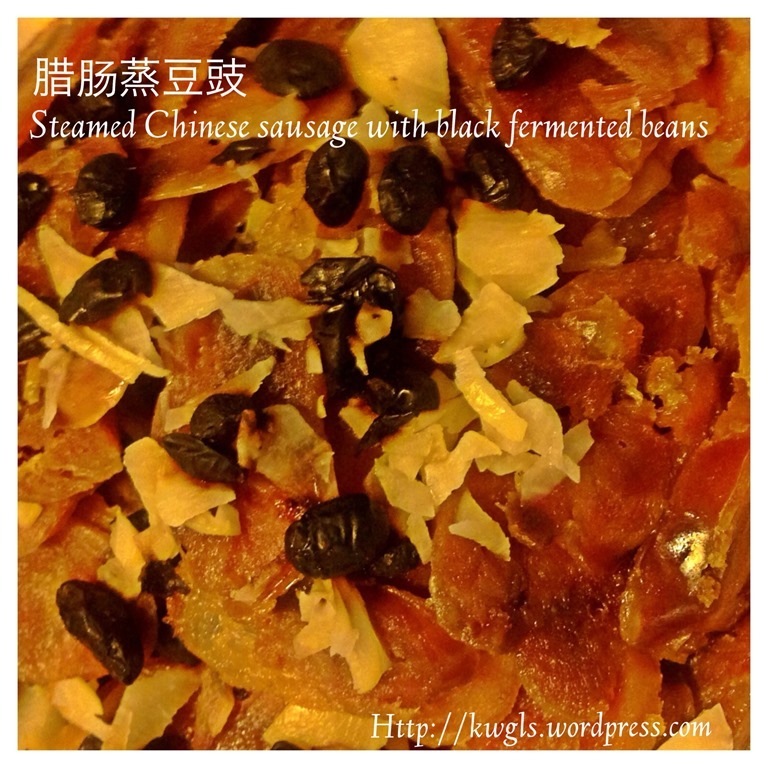 The Chinese sausages were cut into slices, steamed with Chinese black fermented beans and chopped garlics. May be after my vegetarian diets end, I shall cook this. Good thing about having this post is that it can remind me of what I should cooked when I run out of ideas. I never have this combination before, pork bellies plus pigtails. The reason is because both meats have different cooking times. You know pork bellies are rather difficult to cook until soft. So, it is not easy to cook this soup. Even if you used pressure cooker, both items will have to be cooked separately. There is no vegetables or white peppers. It is pure meat broth! If you ask me whether it is yummy or not, of course, I can’t tell you directly because I did not taste it. However, from my years of cooking experience, I can tell you that it is a good soup because the soup had turn milky meaning all the gelatine from the meat have been dissolved in the soup/broth. I remembered when I told my mother in law and wife to stir fry water cress previously, they are against it as they always used water cress to cook soup. It is generally true that most Chinese dialect groups like to boil soup with this vegetable. 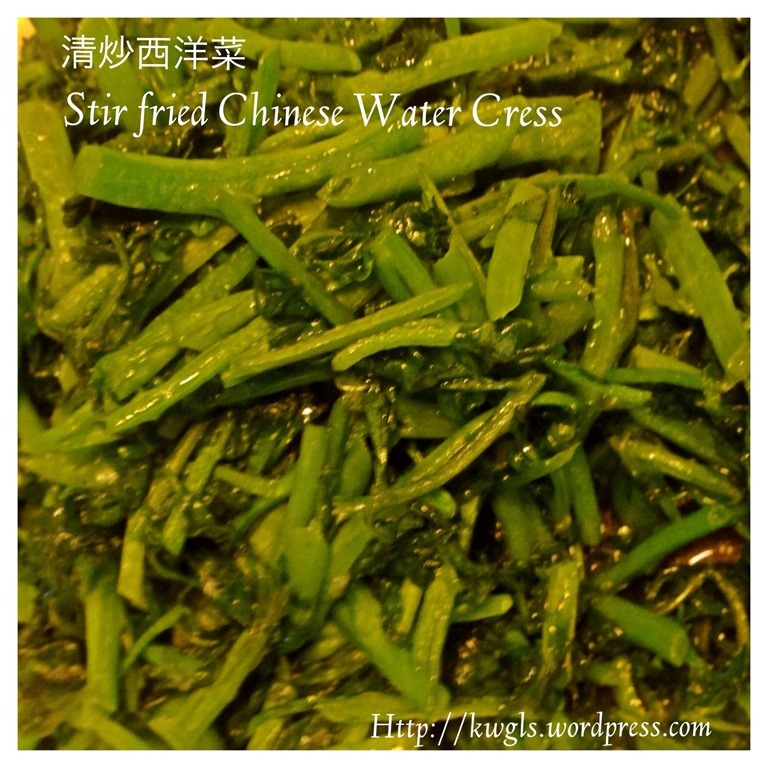 However, when I travelled to China, I always have stir fried water cress in restaurants. Usually, this vegetable were stir fried using garlic without any other ingredients. Try and tell me whether it is nice or not! Remember that you have to stir fry the vegetables using high heat, otherwise, it may be bitter. When I asked for the name of the dish, I was told “namguamifenrou”. However, I can’t find any rice vermicelli or Beehoon. Later she explained the 米粉 is not rice vermicelli, it means “rice flour”. Though the name is called rice flour, the coating of the meat can be any types of flour. 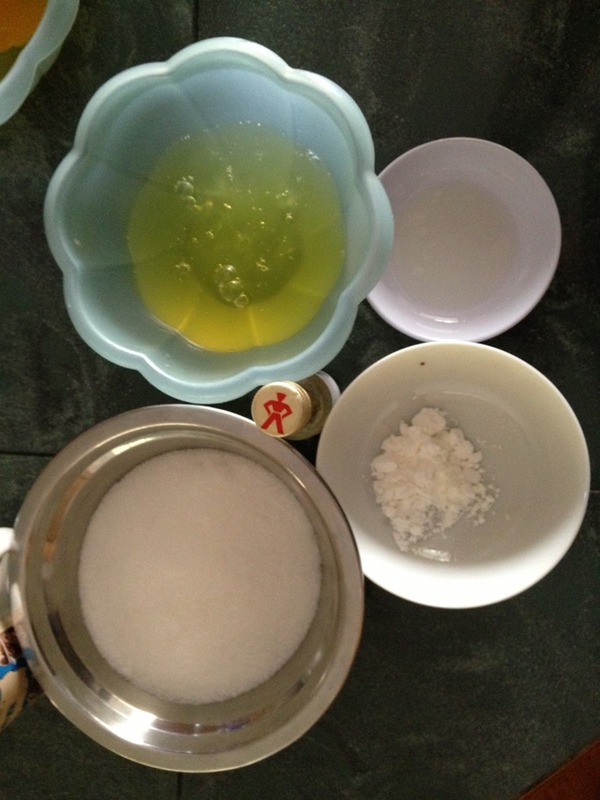 It can be corn flour, sweet potato flour, potato flour and etc.…But today the flour that she used is kudzu flour (葛根粉）. Again this is brought from Jiangxi and she disclosed that this was made from wild kudzu roots. Kudzu has many health benefits and among them are relief symptoms of postmenopausal women, reducing alcohol intake, alleviating cluster headaches, managed metabolic syndromes etc. etc. etc. In Singapore, we do have a type of Chinese instant flu medicine called Kudzu soup (葛根汤) that you consumed when you have a fever and it is believed that it will help to reduce your body temperature. You may want to know more about kudzu from here. Coming back to the dish. Meat were seasoned and coated with kudzu flour. The meat was then placed on top of the pumpkins and steamed under high heat until the pumpkins were soft. The purpose of the flour is to retain the meat juiciness in the process of steaming. Any meat juices that escaped will dripped into the pumpkins those flavoured the pumpkins. Lastly, I want to convey my sincere thanks to my relatives who cooked us a sumptuous meal and we really appreciate that. 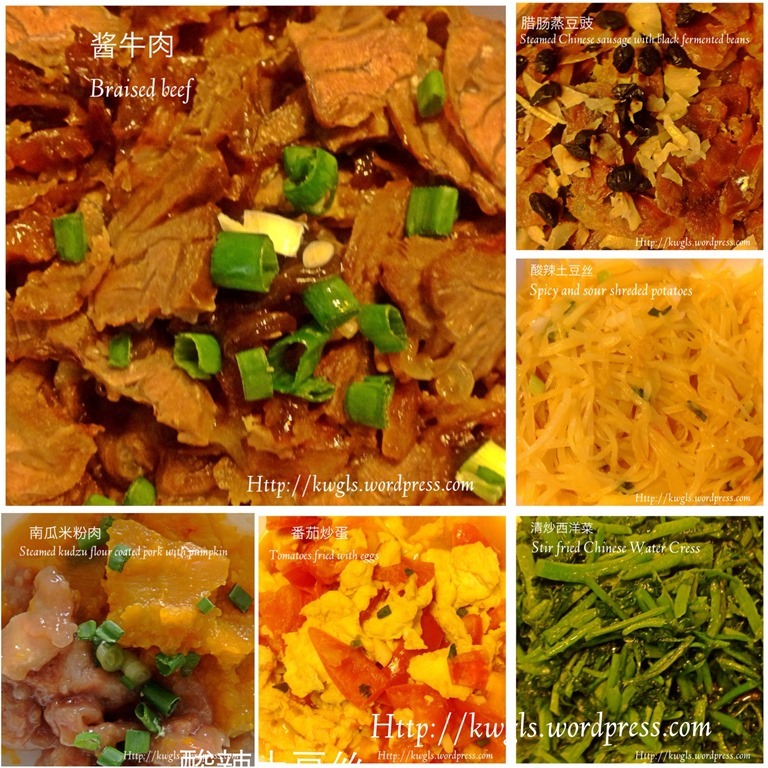 Hope you like the post today and I find this post is meaningful to share with readers about other different types of Chinese cuisines. The following are temporary indices for all recipes issued by Guaishushu in both https://kwgls.wordpress.com and Guaishushu’s Facebook Page. The index shall be for temporary references only. Some Aloe Vera Sweet Fruit Dessert Just Specially For You, Dear! Need A Drink To Repair Your Vocal Cord? Hawthorn Ume Is The Tea For You! Homesick Buns? Yes, I am homesick of Sarawak Style Butter Buns.. Butter Cake/Pound Cake Hey, My Chick Want To Eat My Zebra Pound Cake ! Where is my cake? 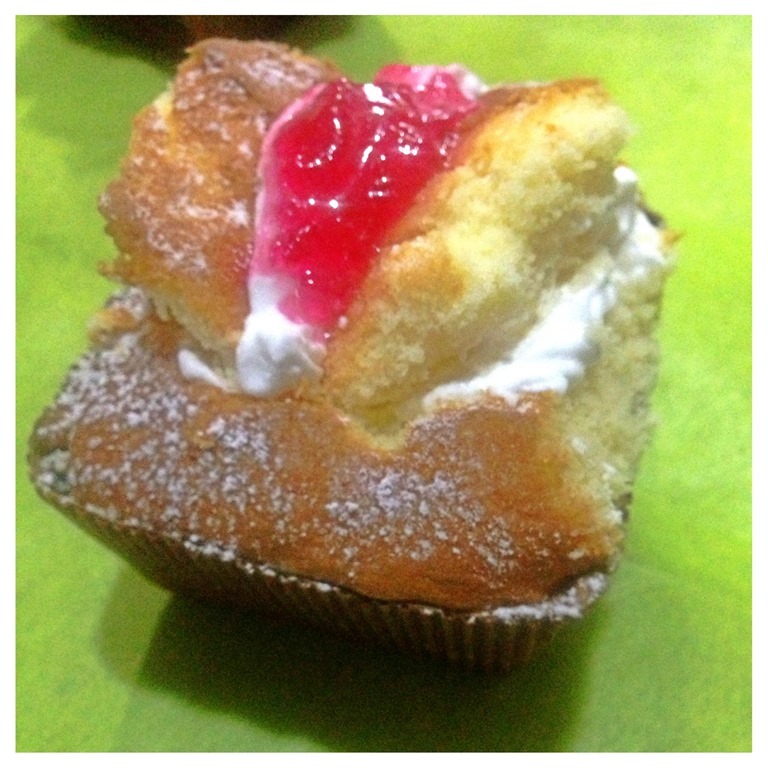 I Can’t See!–Famous Sarawak Midnight Cake (Cake Seri kaya Sarawak) revisited.. 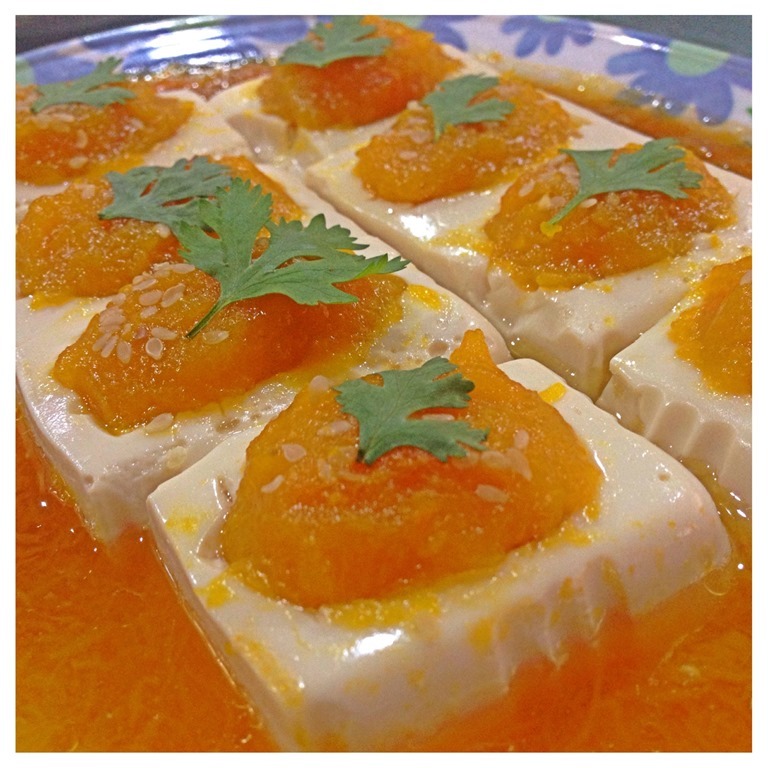 Grapefruit Chiffon with Grapefruit Citrus Glaze,… Ever Try This? 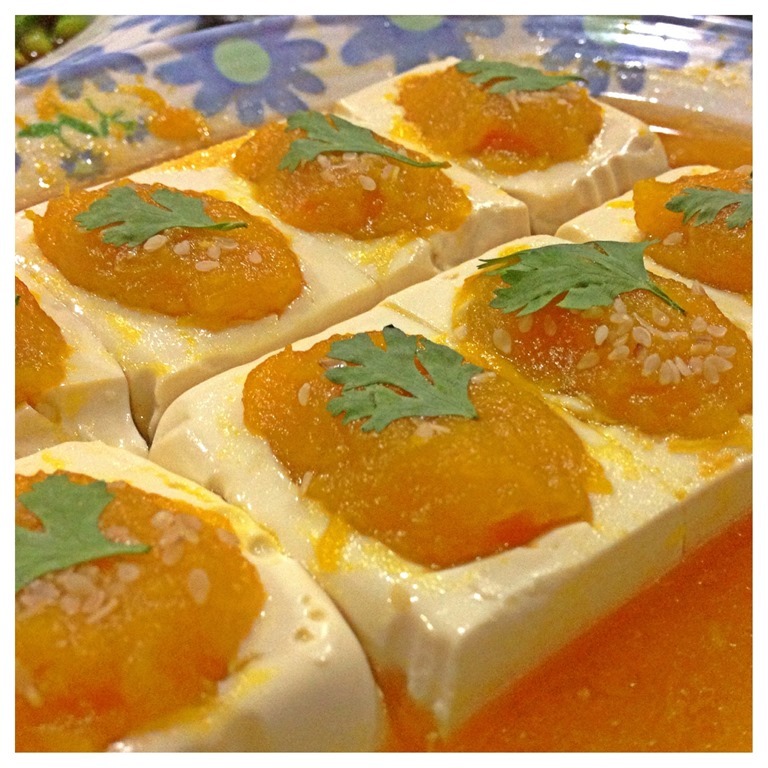 King of Fruits + Cream Cheese = Durian Cheesecakes, Game to Try? Why Not Cook Your Mother A Meal Of Chicken Rice This Coming Mother’s Day? Let’s See How An Asian Make The Tomato Pasta Sauce From Scratch and How He Baked His Pasta…. Can You Stand The Smell of Belachan (Shrimp Paste)? You may be wandering why there are 2 soups. The reasons is easy. I am testing my new pressure cooker. I am using the new pressure cooker to cook my salted vegetable duck soup. Very simple soup and some soup that’s well like by the kids. 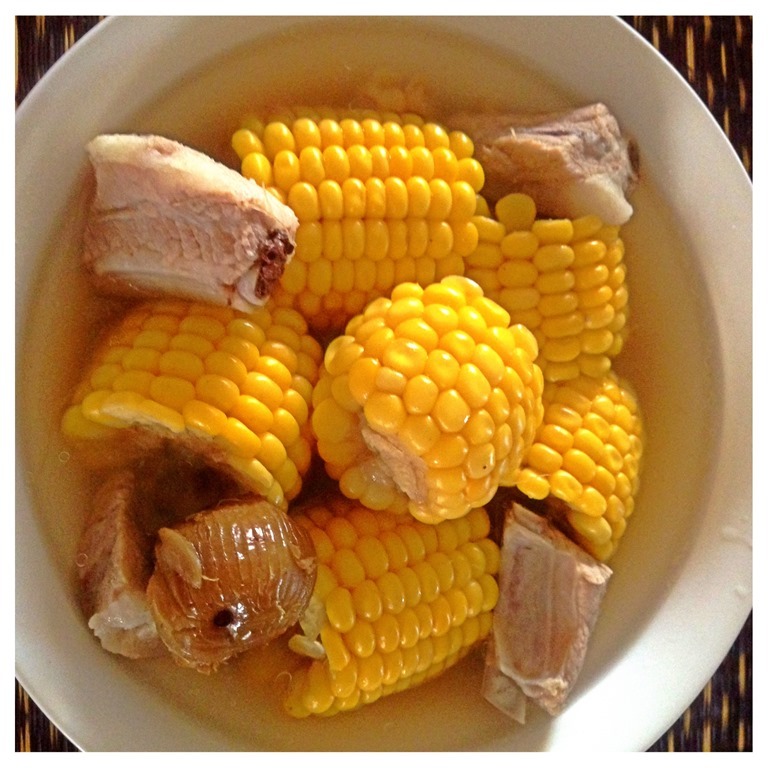 When I was young, my mum never use sweet corn to made soup. This soup was introduced to me by my mother in law when my kids were born. Now, i also started to like this soup. I have forgotten to put carrots and mushrooms so it is a rather pure sweet corn soup boiled with goof berry and sweet dates. This is a vegetarian dish. However, if you are a vegetarian by religion, please omit the shallot oil. The simple recipe is to blanch the Chinese lettuce with boiling water (with drips of oil to preserve the colour) for about 1 minute. For the sauce, get ready 2 cubes of Chinese fermented bean curd (either white or red color), mash it, add a tablespoon of water, drips of sesame oil or shallot oils, 1 teaspoon of sugar (no more salt as fermented bean curd is very salty). Mixed well and pour on top of the blanched vegetables. Sugar is to negate the saltiness of the fermented bean curd. Variation: Miso paste can also be considered. 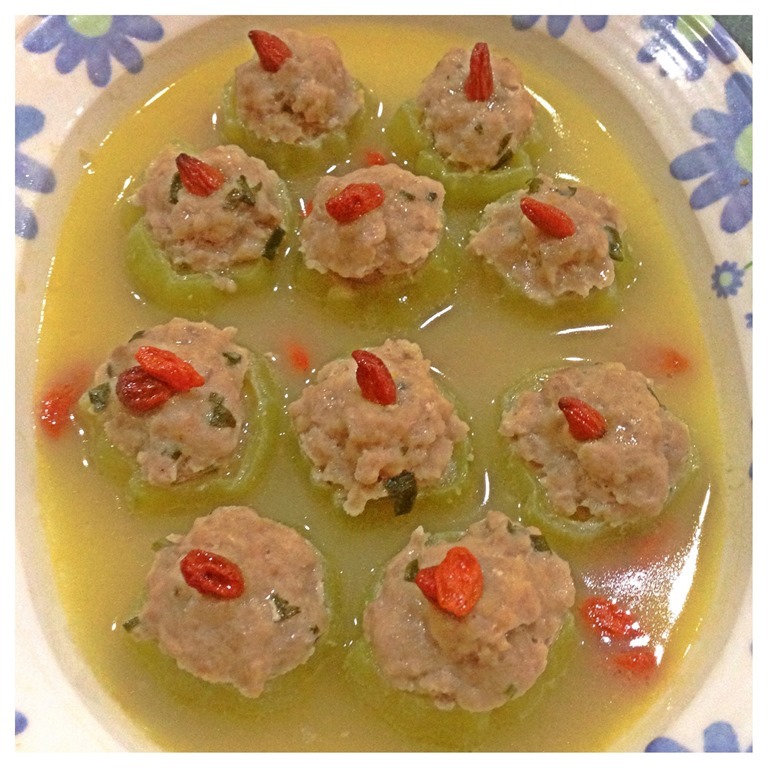 You can refer the recipe in the links in Guaishushu’s Facebook Page as above. 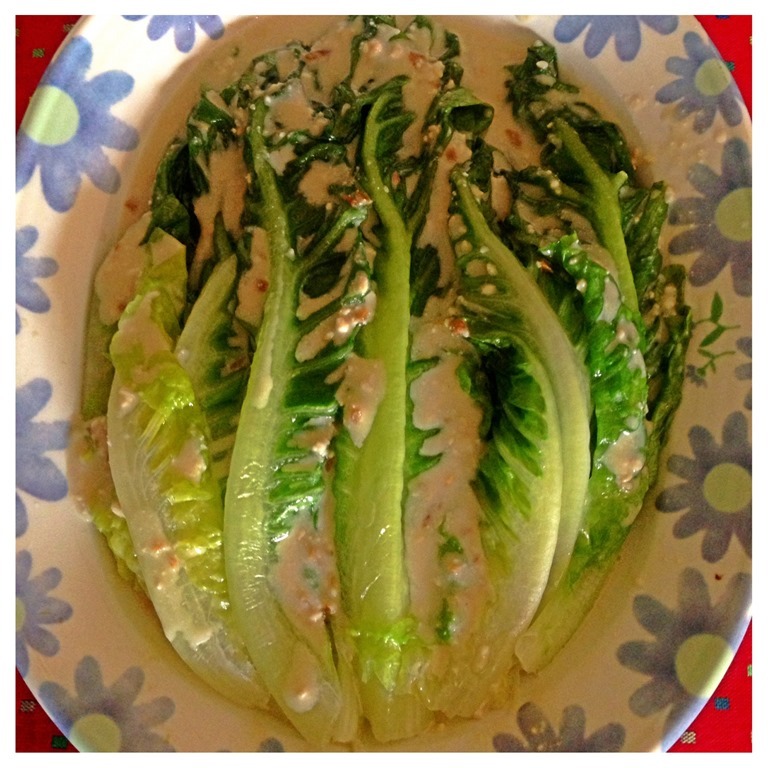 A kid friendly dish, soft and smooth with full flexibility. As explained above, a dish that I cooked using my new pressure cooker. It only take me about 1 hour to cook until the desired texture and taste. That is totally not possible if we cooked using the traditional way. A separate post will be issue to give a detail description on the method of preparation. Hope you like the post today. Happy reading and have a nice day ahead.